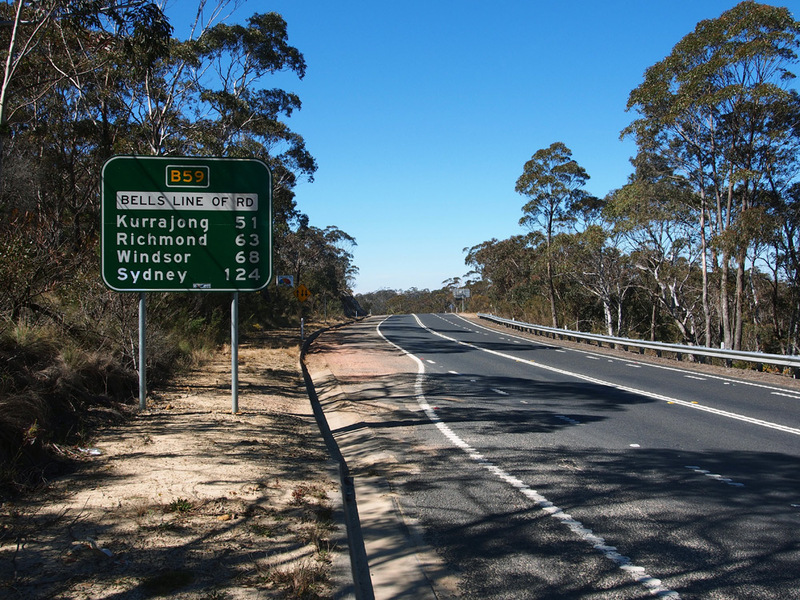 RD sign eastbound on Bells Line of Road after the junction with Comleroy Road, Kurrajong. Source: Michael Durrant, August 2013. 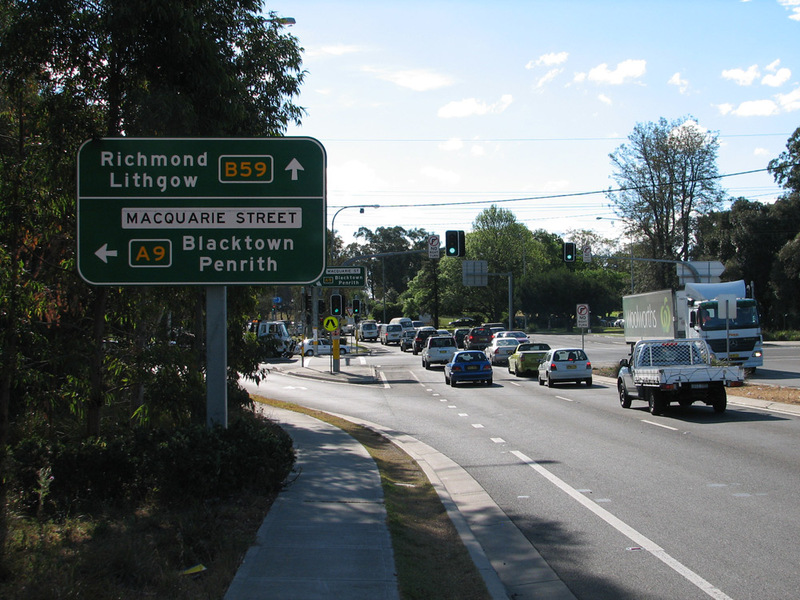 Route B59 is a radial route extending west from Sydney. 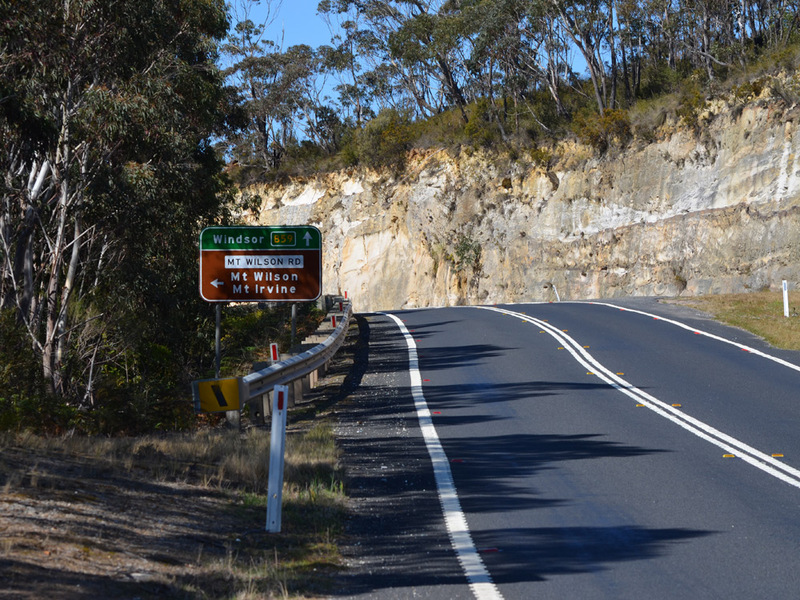 It is one of only two crossings of Blue Mountains, playing a vital role in connecting the Sydney Basin with Central Western New South Wales. 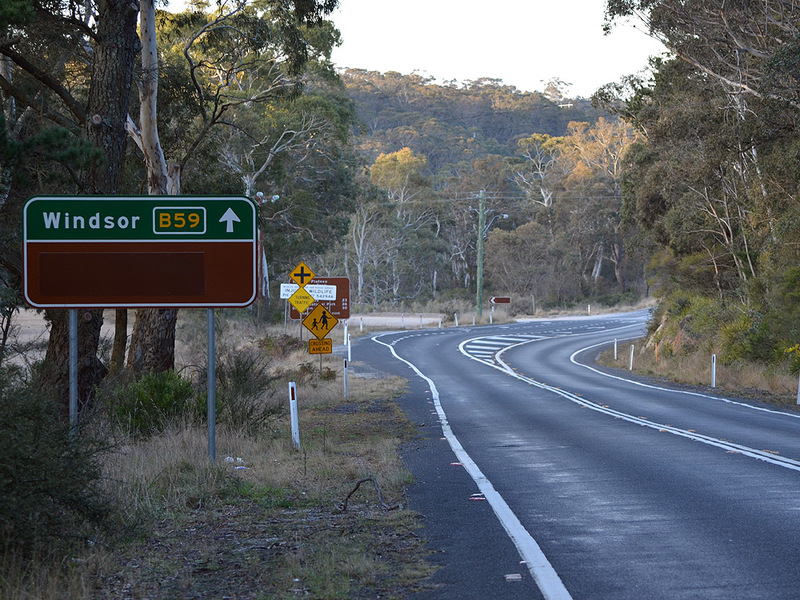 B59 replaces the portion of former State Route 40 between Windsor and Lithgow. 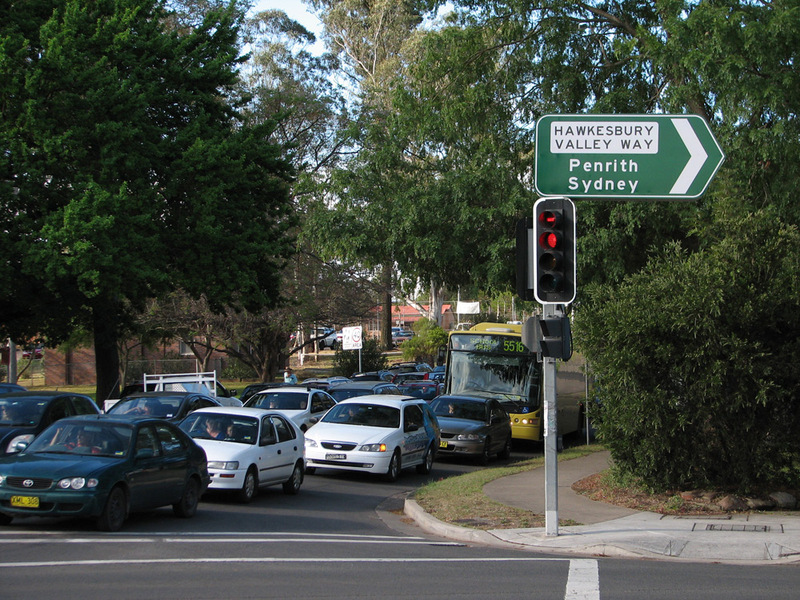 At present there is a ridiculous situation where B59 terminates at A9 Macquarie Street in Windsor. 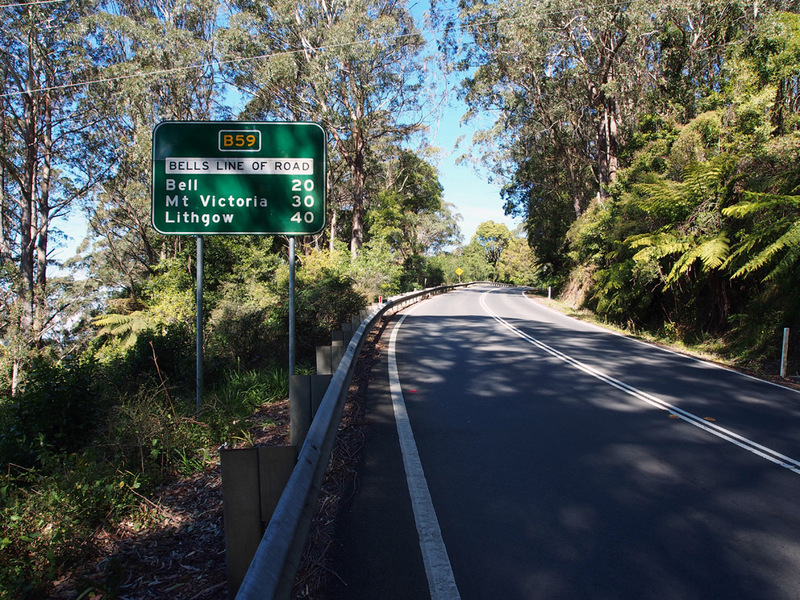 Motorists navigating by route numbers would be encourage to follow A9 into Windsor, then A2 through McGraths Hill to head further east, whilst the direct eastern continuation of Hawkesbury Valley Way is signed for Sydney but remains unnumbered. This situation is equally applicable for westbound traffic. 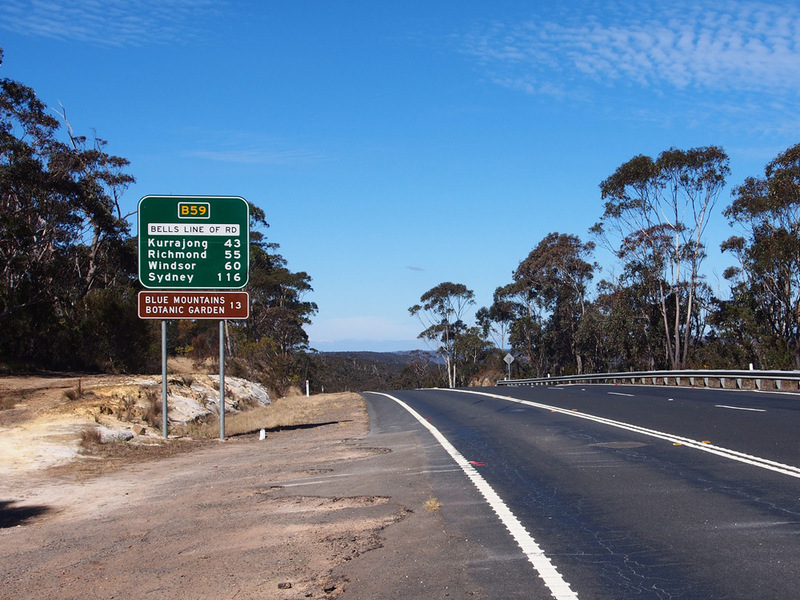 RMS advised in 2013 that they will be considering the extension of B59 as part of a possible 'Stage 2' alpha-numeric scheme - let's hope this happens sooner rather than later. 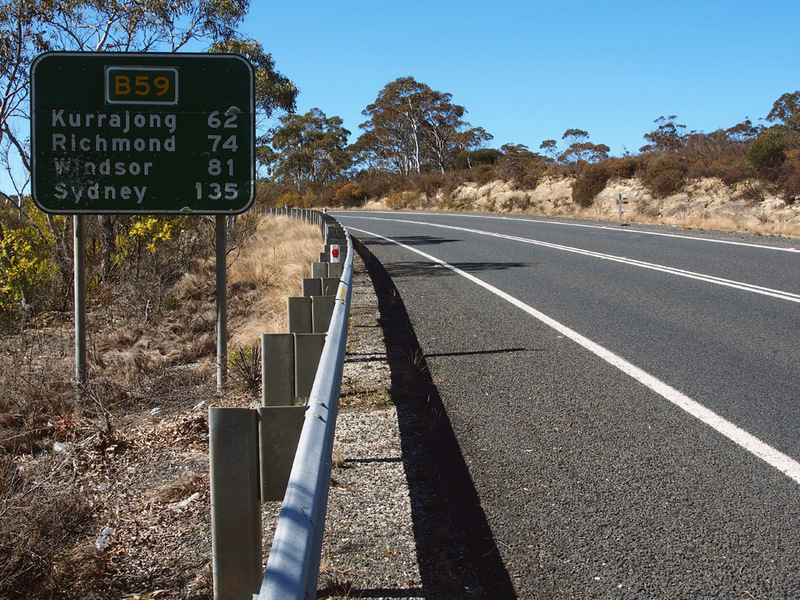 The vast majority of signs along the route date from the period 2009-2012 and therefore include the B59 route marker. 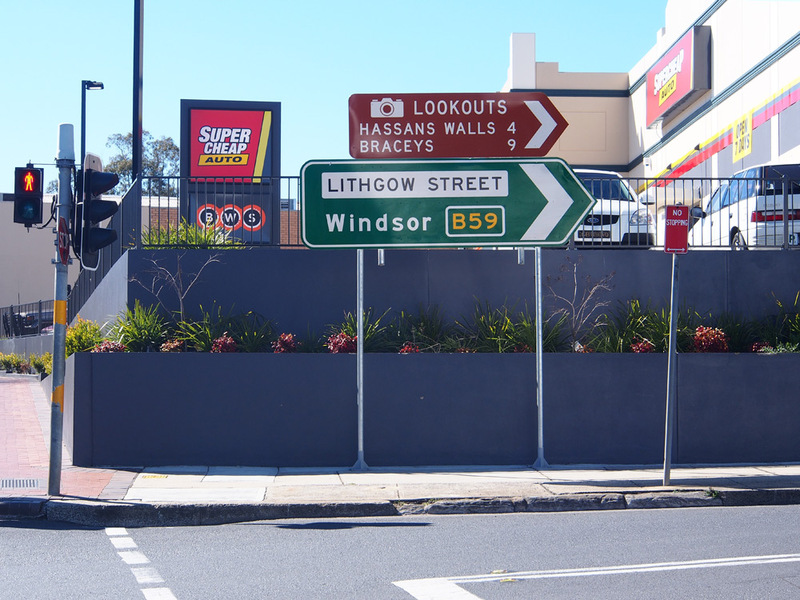 Coverplates were only considered necessary on a handful of signs including, strangely, ID signs installed in 2007 at Macquarie Street, Windsor. 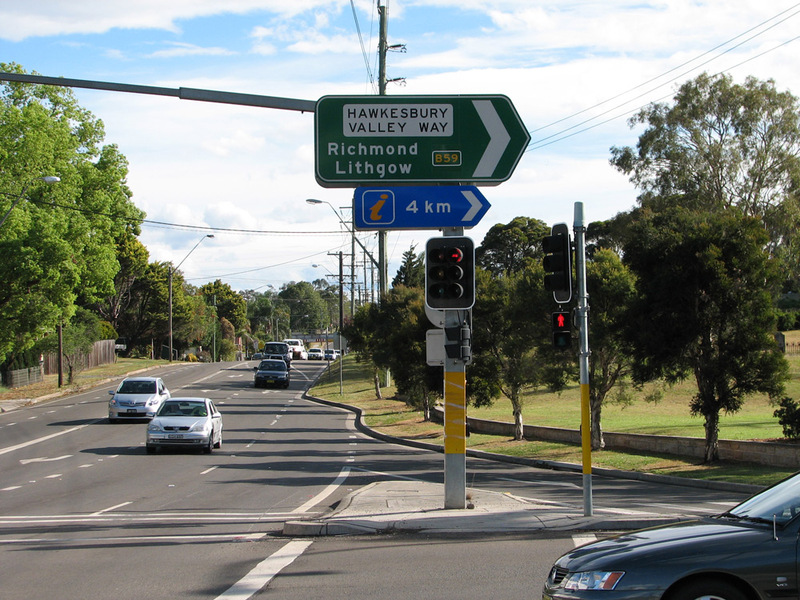 AD sign southbound on Macquarie Street approaching the junction with Hawkesbury Valley Way, Windsor. 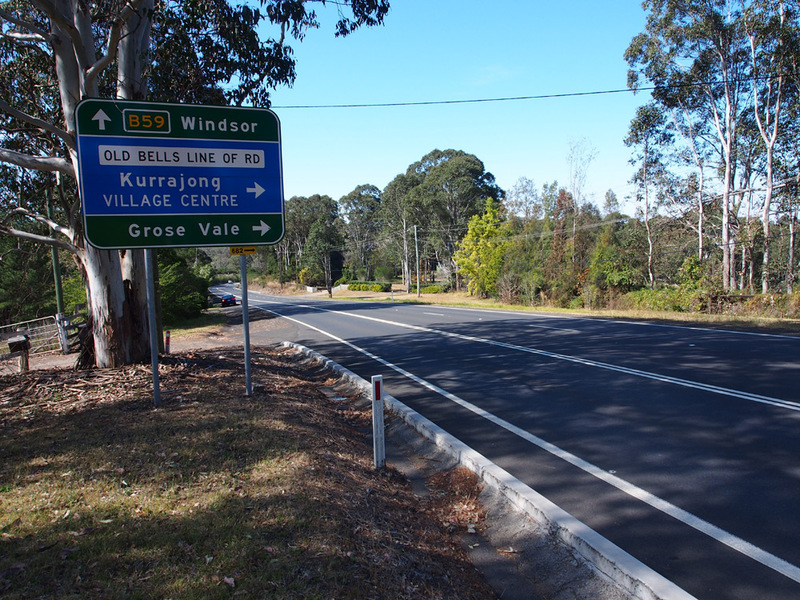 This is the current eastern terminus of B59 but hopefully not for long - it should, of course, be extended east along Hawkesbury Valley Way and Groves Avenue to meet A2 Windsor Road at Vineyard. 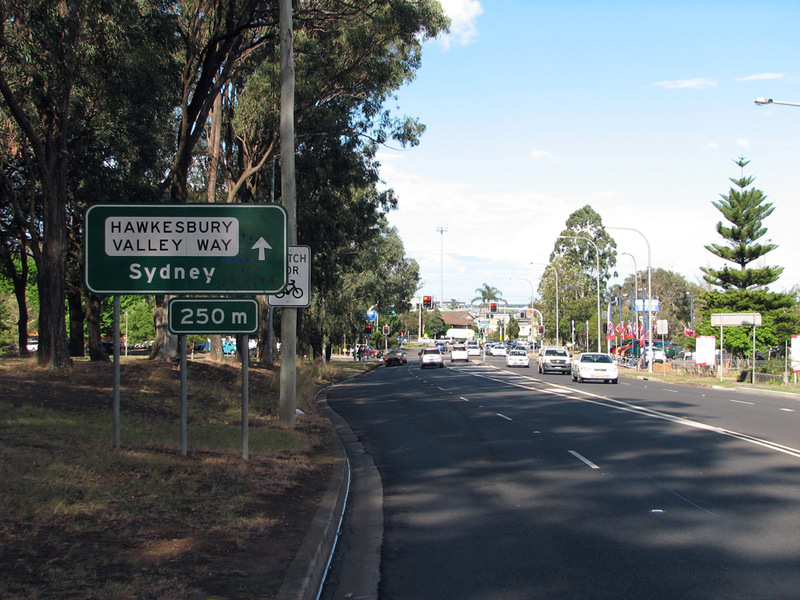 AD sign westbound on Hawkesbury Valley Way approaching the junction with Macquarie Street, Windsor. 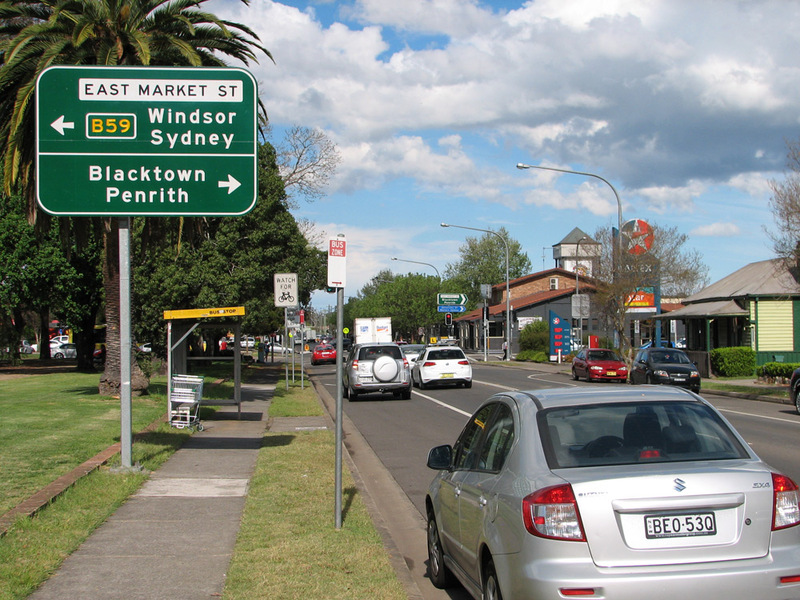 AD sign northbound on Macquarie Street approaching the junction with Hawkesbury Valley Way, Windsor. 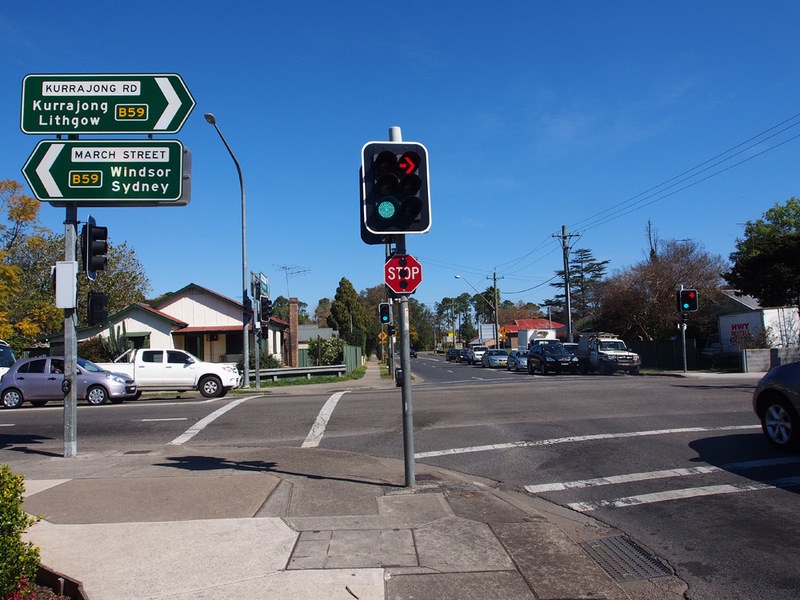 Poorly coverplated ID signs at the junction of Macquarie Street & Hawkesbury Valley Way, Windsor. 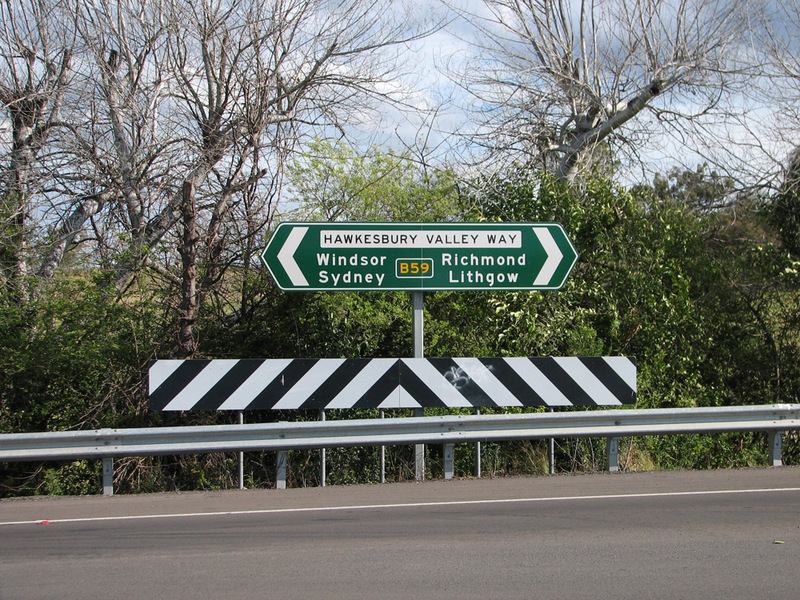 These signs were installed in 2007 when Hawkesbury Valley Way was named but for some strange reason did not include the B59 route marker. 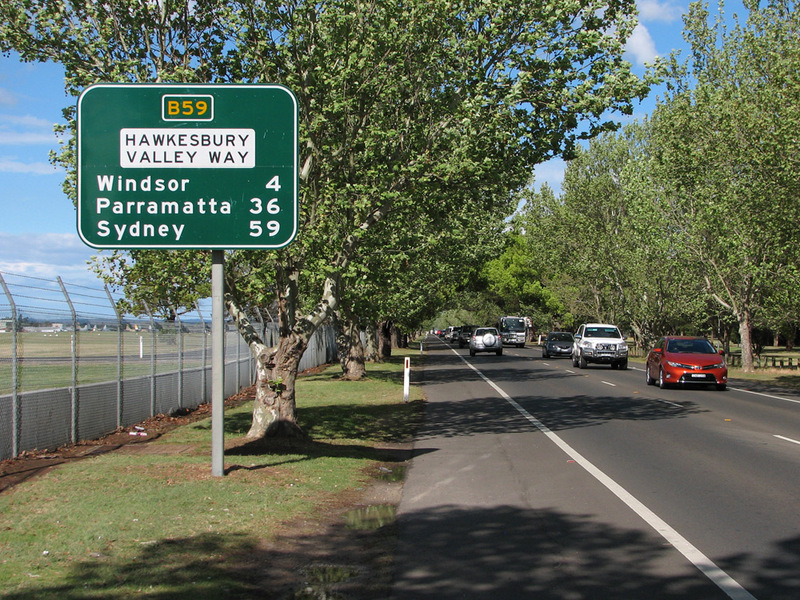 AD sign eastbound on Hawkesbury Valley Way approaching the eastern terminus of B59 at Macquarie Street, Windsor. 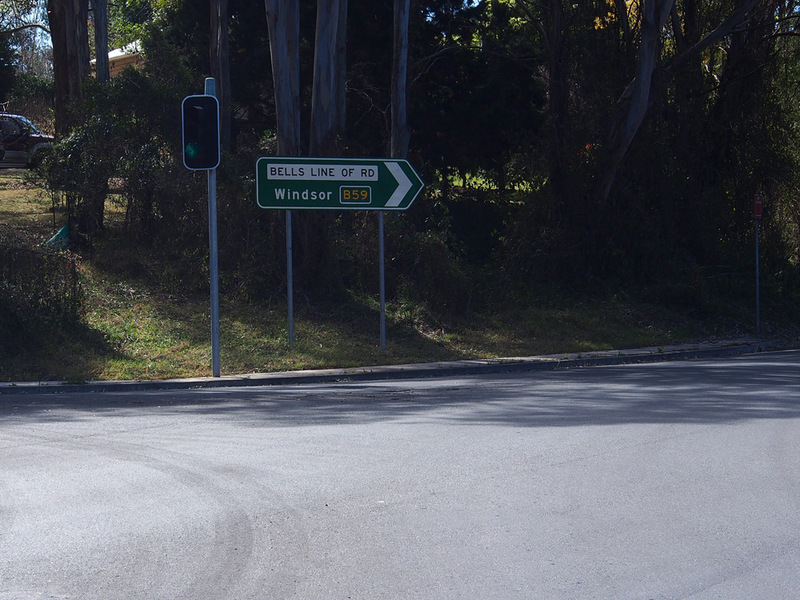 Hopefully B59 will be extended east from this point to meet A2 Windsor Road at Vineyard. 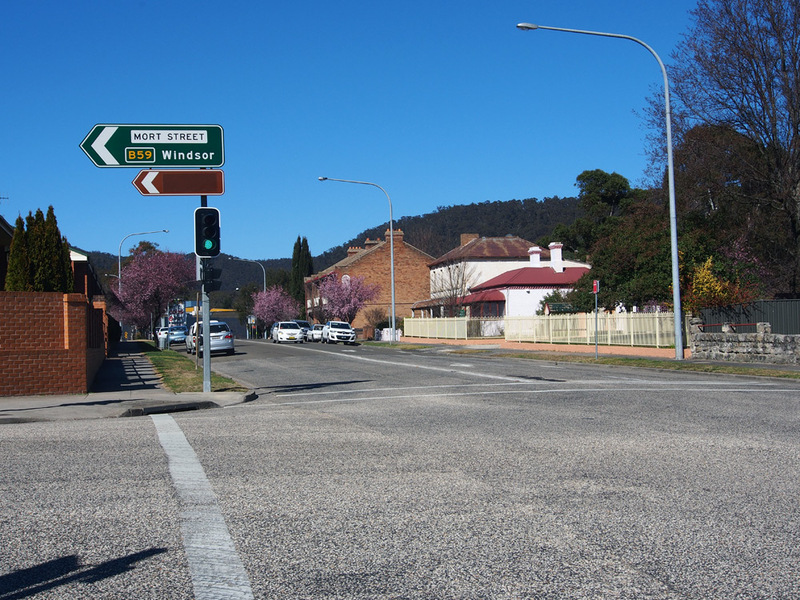 ID signs at the junction of Hawkesbury Valley Way & George Street, Windsor. 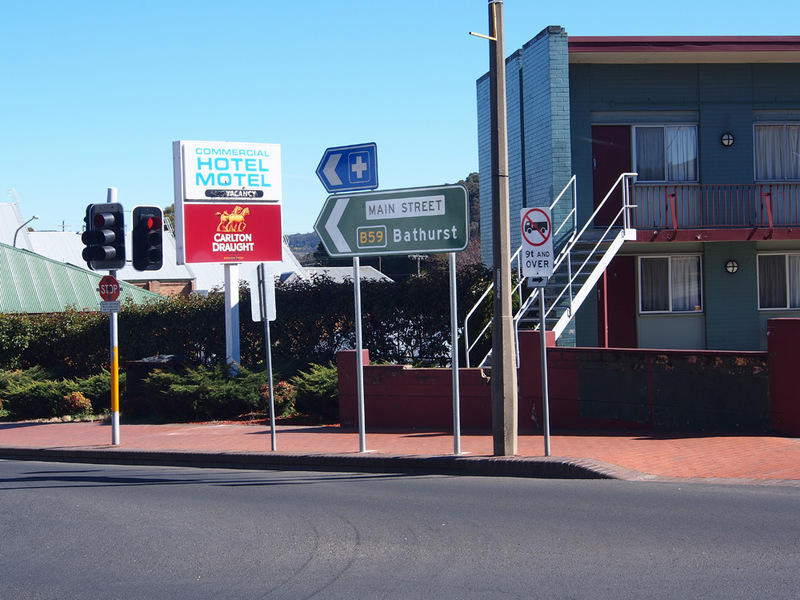 Note the absence of a route marker - either B59 or A9 - on the east-pointing sign. 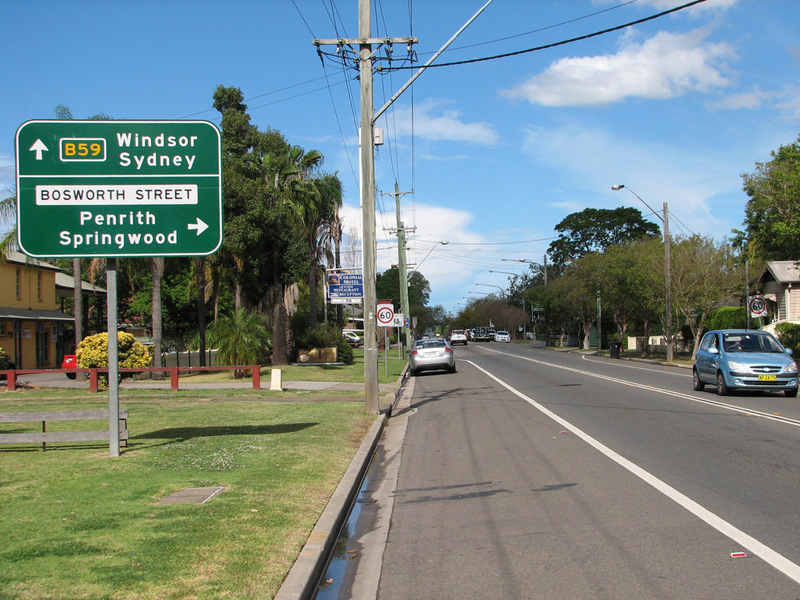 AD sign eastbound on Hawkesbury Valley Way approaching the junction with George Street, Windsor. 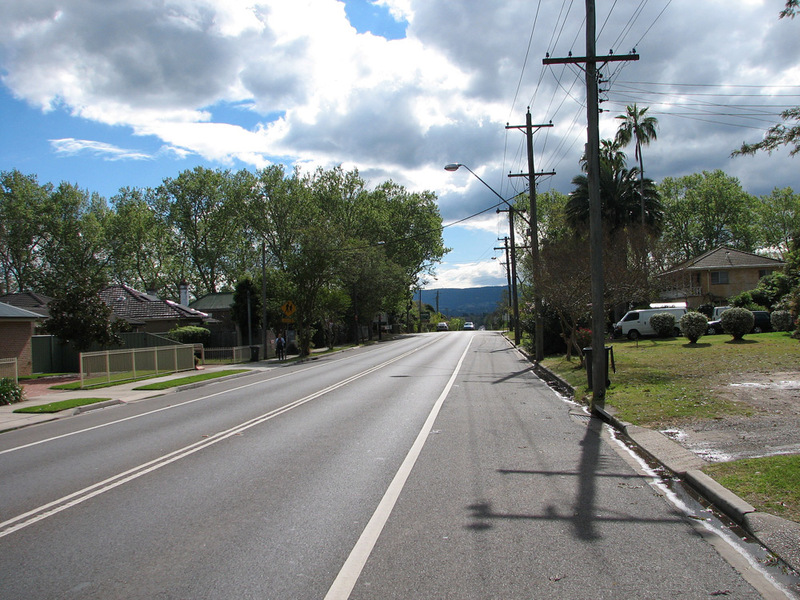 Hawkesbury Valley Way looking east into Windsor at Rum Corp Lane. 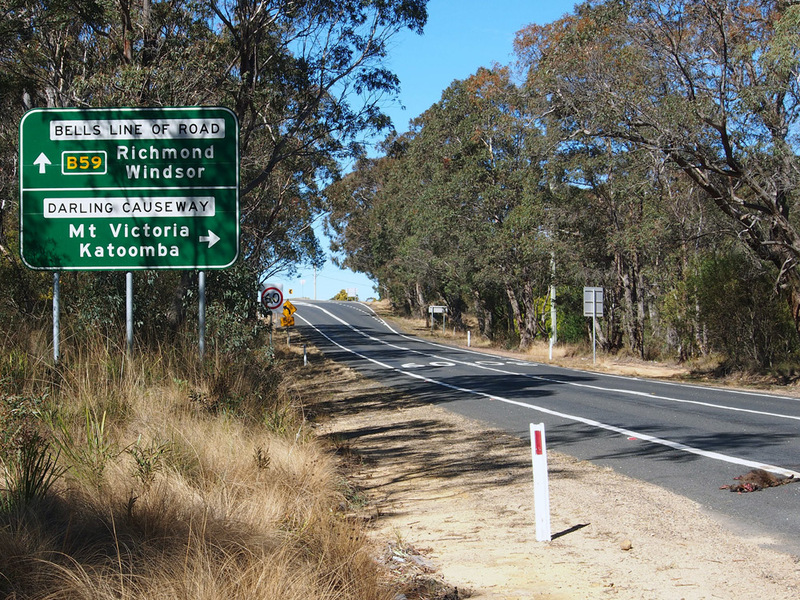 RD sign westbound on Hawkesbury Valley Way as you leave Windsor and cross Rickabys Creek. 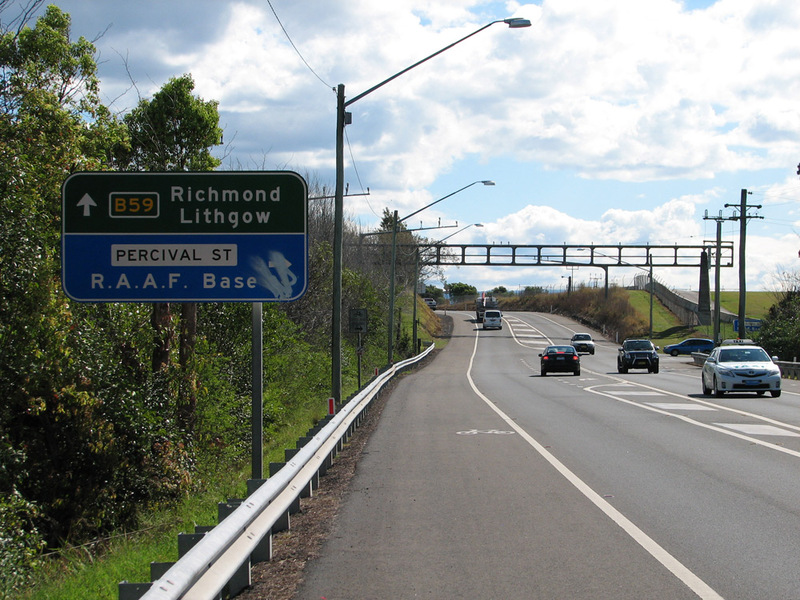 AD sign westbound on Hawkesbury Valley Way approaching the turnoff to RAAF Base Richmond at Percival Street, Clarendon. 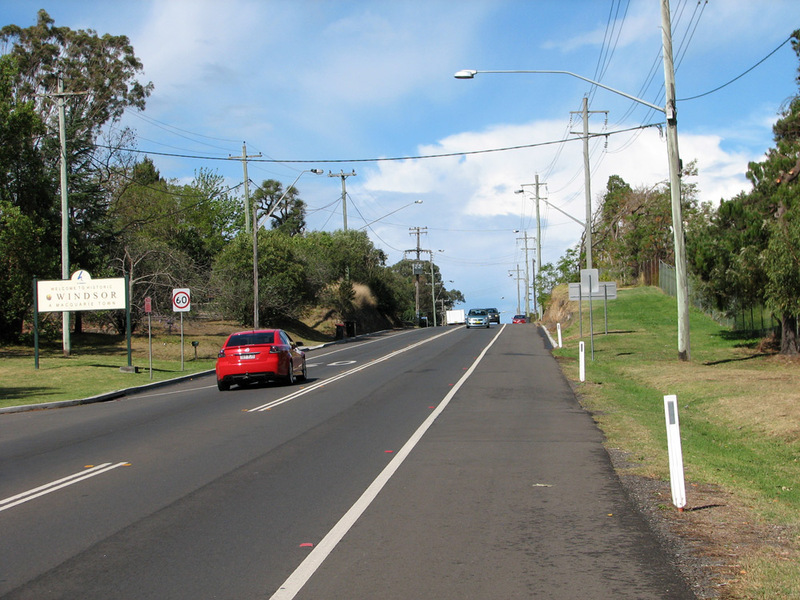 ID sign at the junction of Hawkesbury Valley Way & Percival Street, Clarendon. 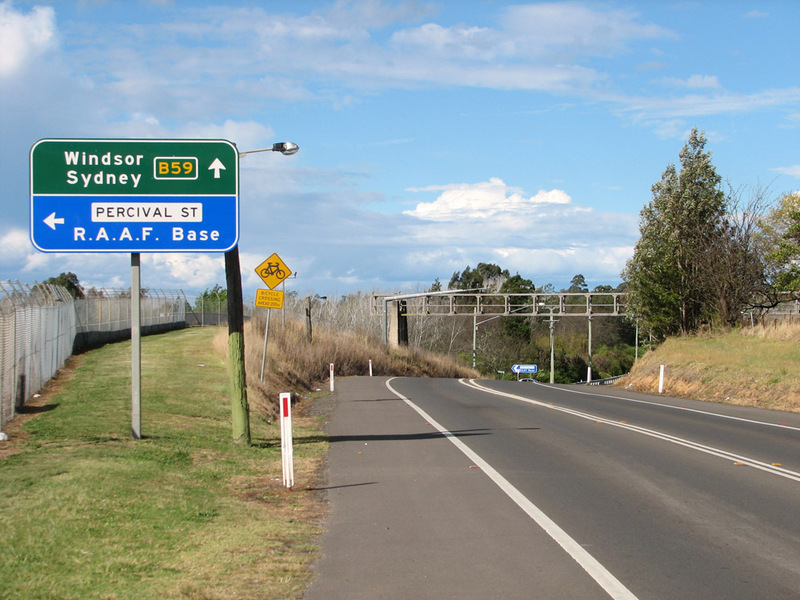 AD sign eastbound on Hawkesbury Valley Way approaching the turnoff to RAAF Base Richmond at Percival Street, Clarendon. 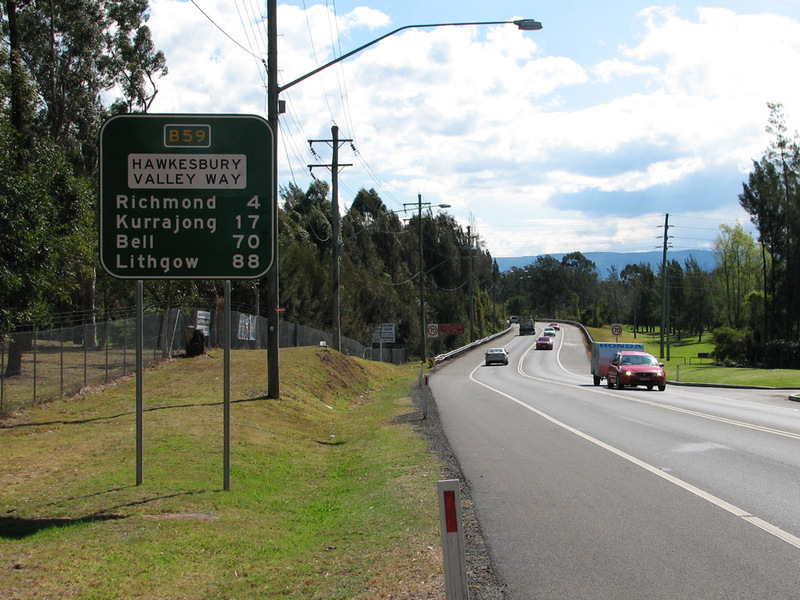 Hawkesbury Valley Way looking west alongside RAAF Base Richmond from near the above sign. 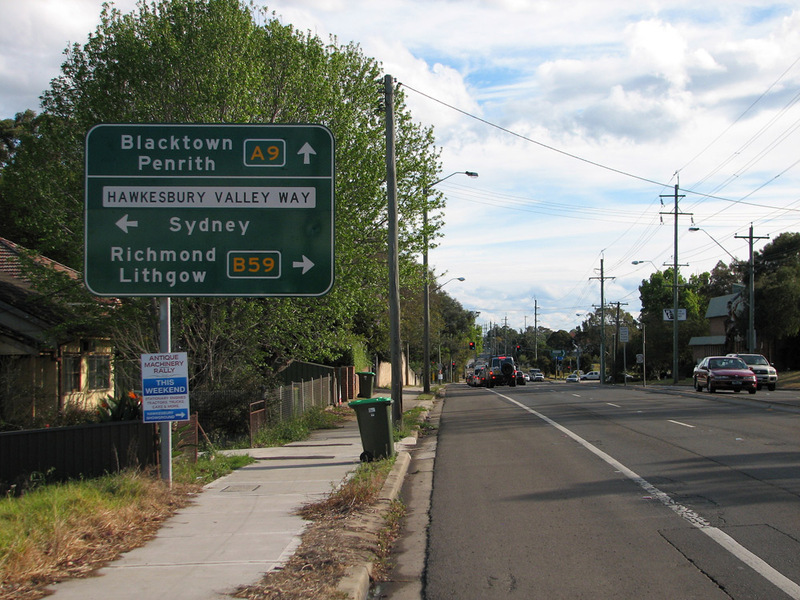 RD sign eastbound on Hawkesbury Valley Way on the eastern edge of Richmond. 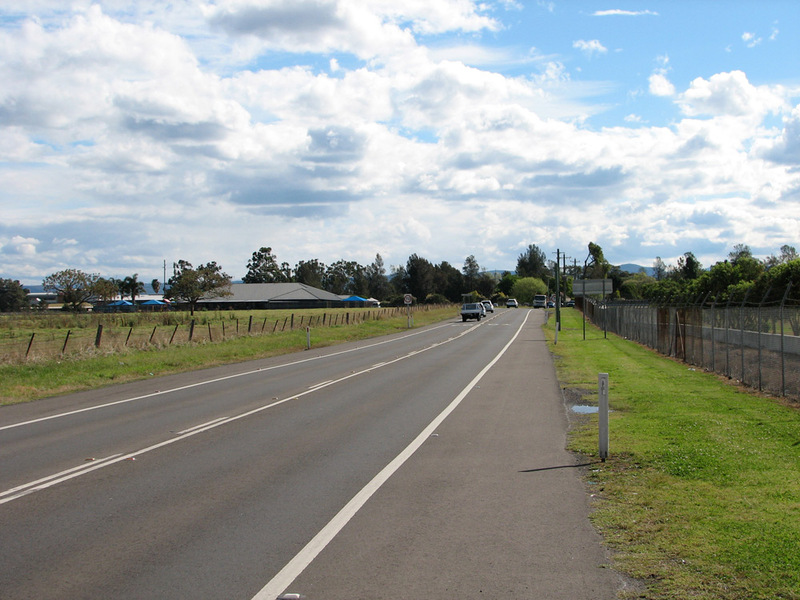 RAAF Base Richmond is behind the fence on the left. 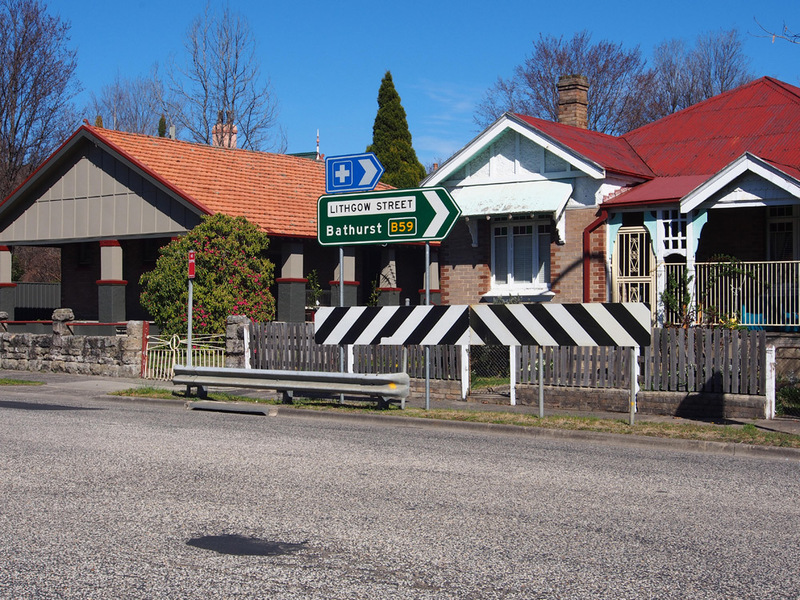 A remnant Tourist Drive 6 trailblazer eastbound on Windsor Street near Pitt Street, Richmond. This relic probably dates from the Council-based tourist drives of the 1980s which are no longer maintained or promoted. 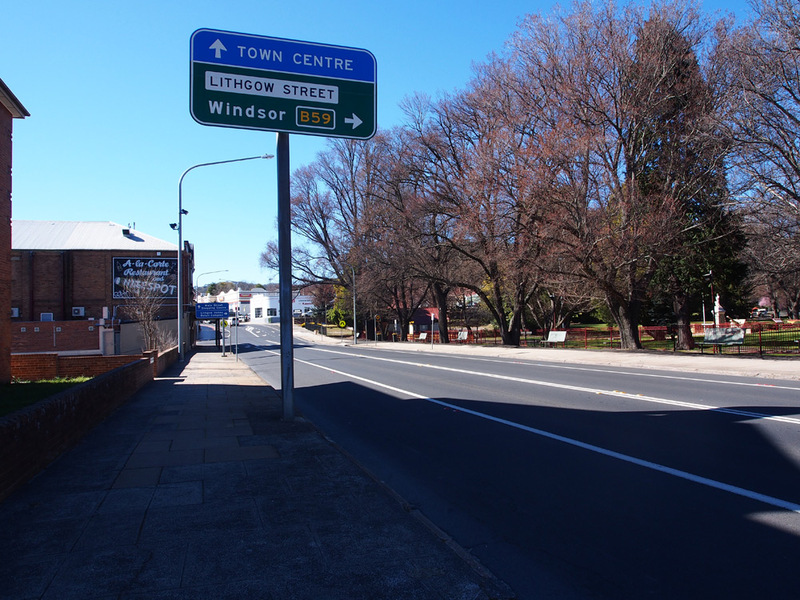 Windsor Street looking east from the junction with East Market Street, Richmond, with the old Regent Theatre in view. 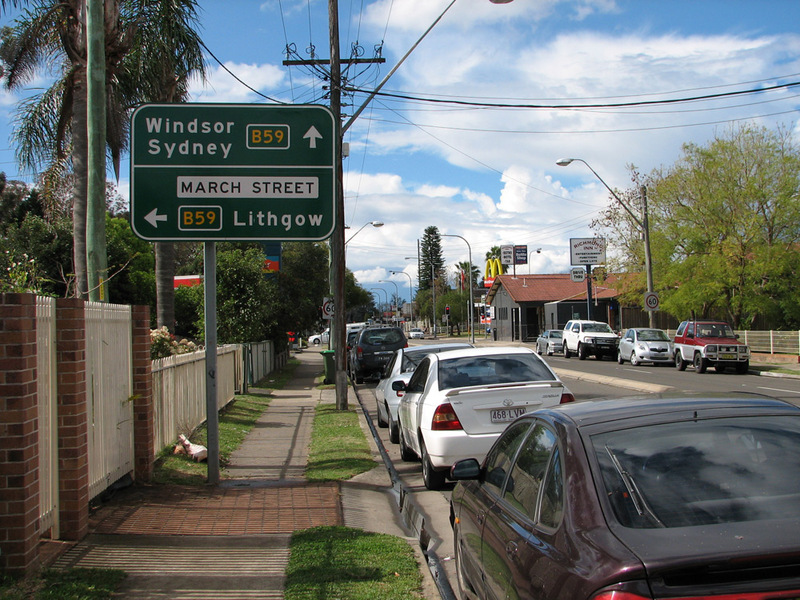 ID signs at the junction of Windsor Street & East Market Street, Richmond. AD sign southbound on East Market Street approaching the junction with March Street, Richmond. 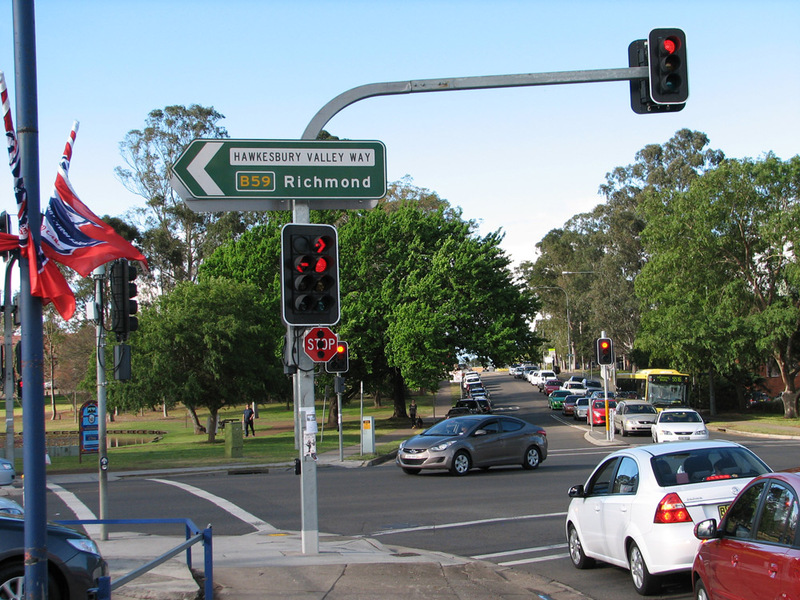 ID signs at the junction of East Market & March Streets, Richmond. Top and middle photos: September 2013. AD sign northbound on East Market Street approaching the junction with March Street, Richmond. AD sign eastbound on March Street approaching the junction with East Market Street, Richmond. AD sign westbound on March Street approaching the junction with Bosworth Street, Richmond. 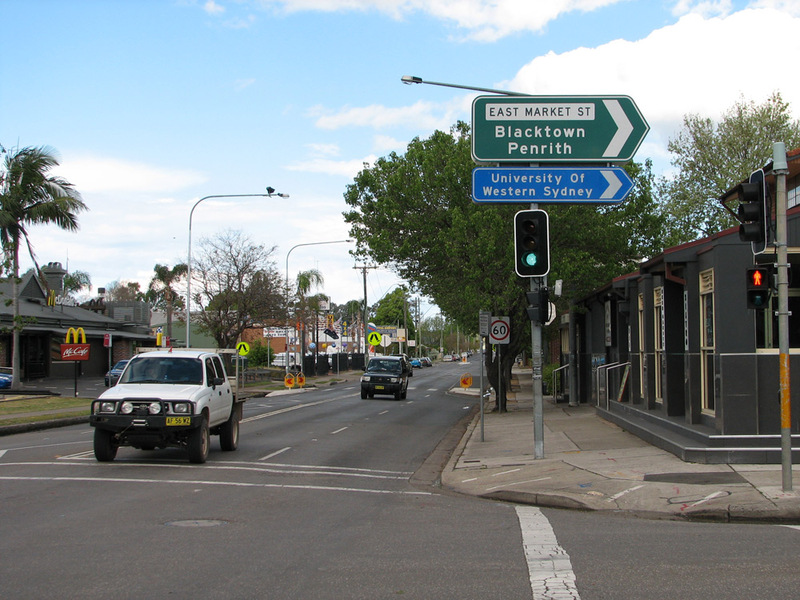 Note the reference to Kurrajong Road - this is one block early as March Street continues to the edge of Richmond townsite at Chapel Street. ID signs at the junction of March Street & Bosworth Street, Richmond. 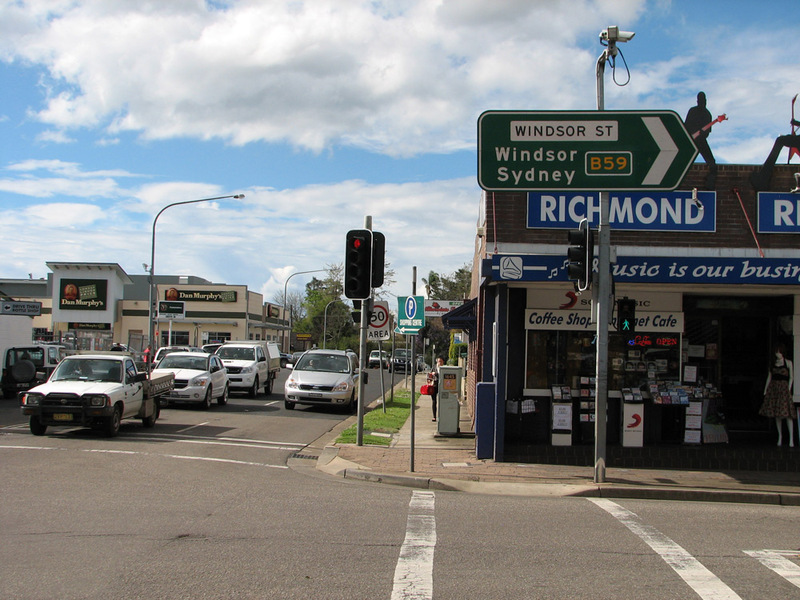 Note the reference to Kurrajong Road - this is one block early as March Street continues to the edge of Richmond townsite at Chapel Street. AD sign eastbound on March Street approaching the junction with Bosworth Street, Richmond. March Street looking west towards Chapel Street, Richmond. 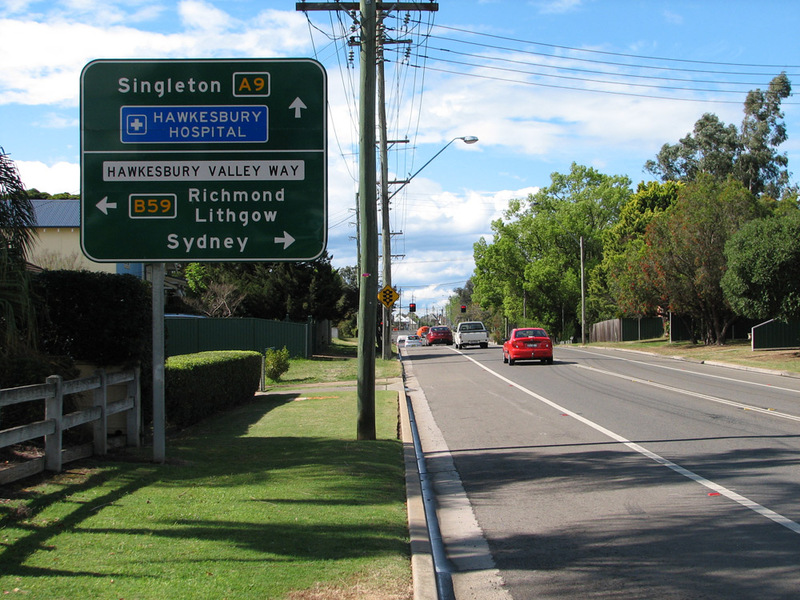 RD sign westbound on Kurrajong Road after the junction with Chapel Street, Richmond. 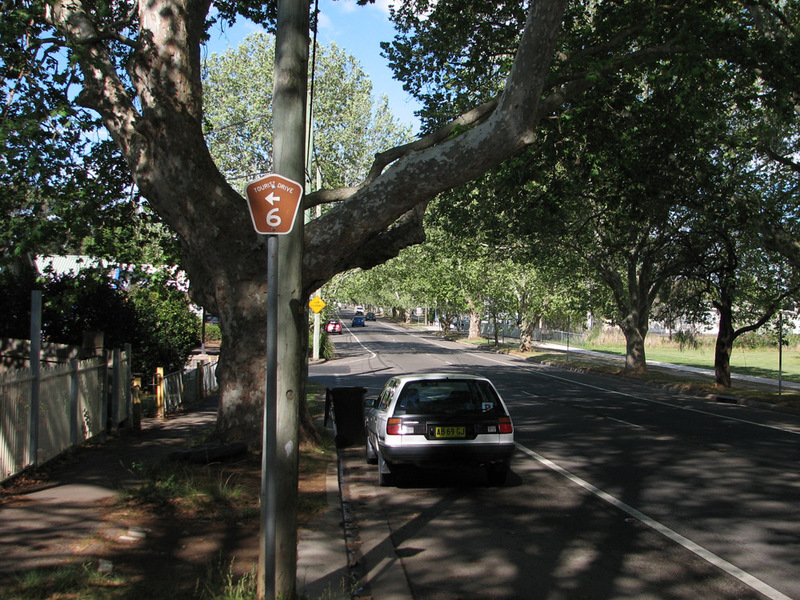 ID signs at the junction of Bells Line of Road, Terrace Road & Grose Vale Road, North Richmond. 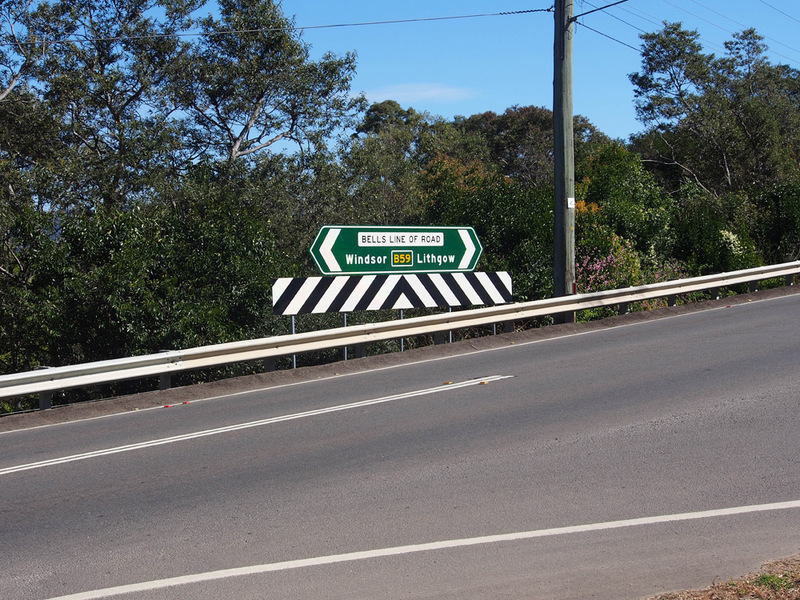 ID sign at the junction of Bells Line of Road & Kurmond Road, Kurmond. 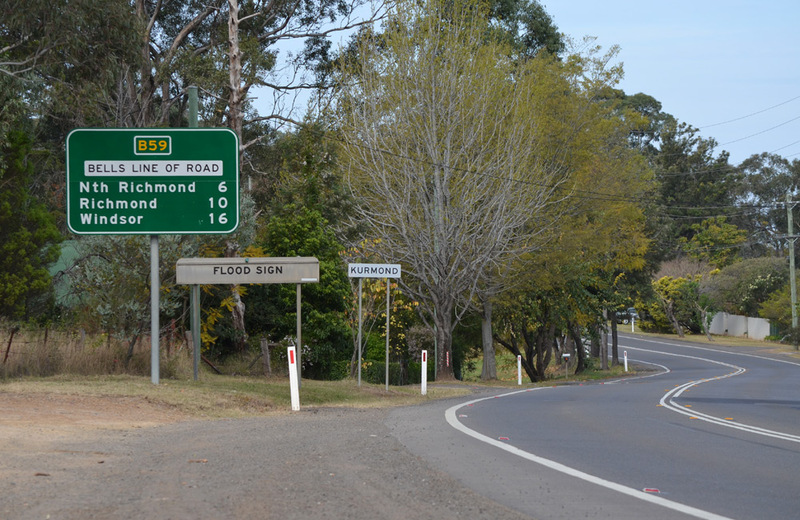 RD sign eastbound on Bells Line of Road after the junction with Comleroy Road, Kurrajong. 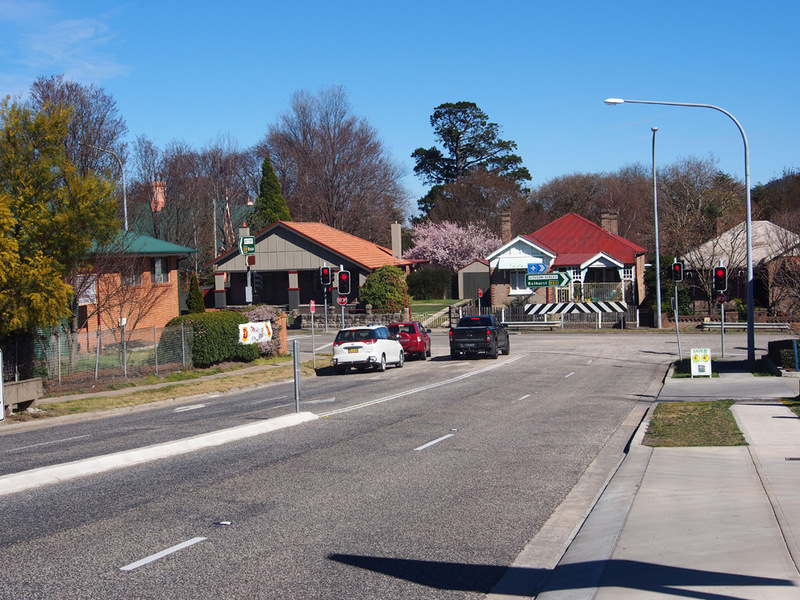 Source: Michael Durrant, August 2013. 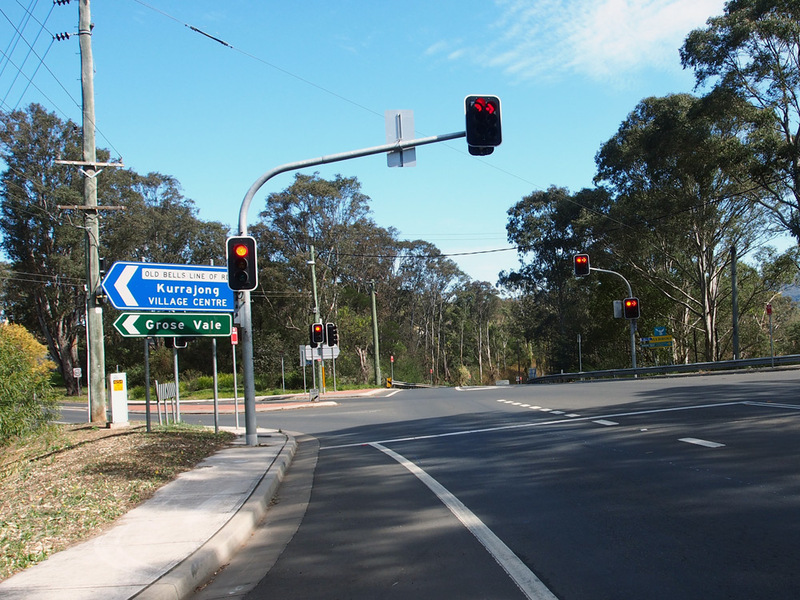 Diagrammatic AD sign westbound on Bells Line of Road approaching the junctions with Comleroy Road & Old Bells Line of Road, Kurrajong. 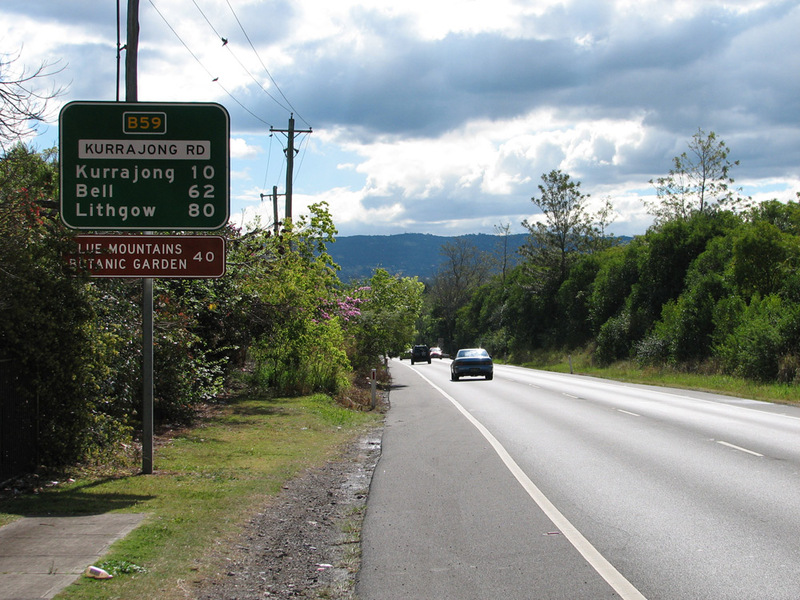 AD sign westbound on Bells Line of Road approaching the junction with Comleroy Road, Kurrajong. 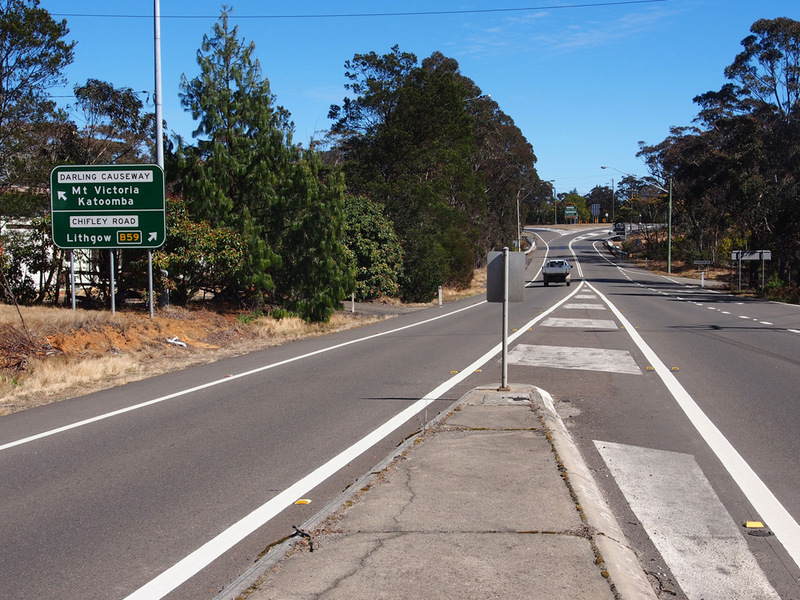 ID signs at the junction of Bells Line of Road & Comleroy Road, Kurrajong. 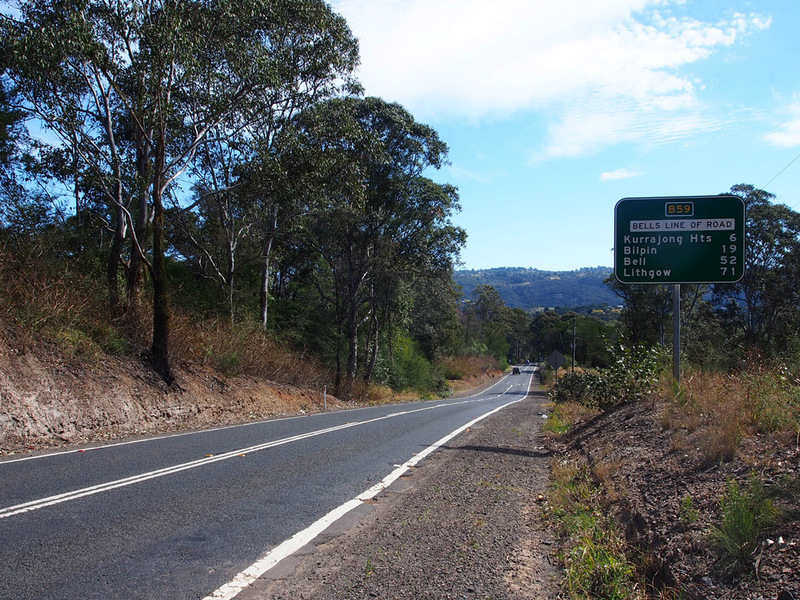 AD sign eastbound on Bells Line of Road approaching the junction with Comleroy Road, Kurrajong. 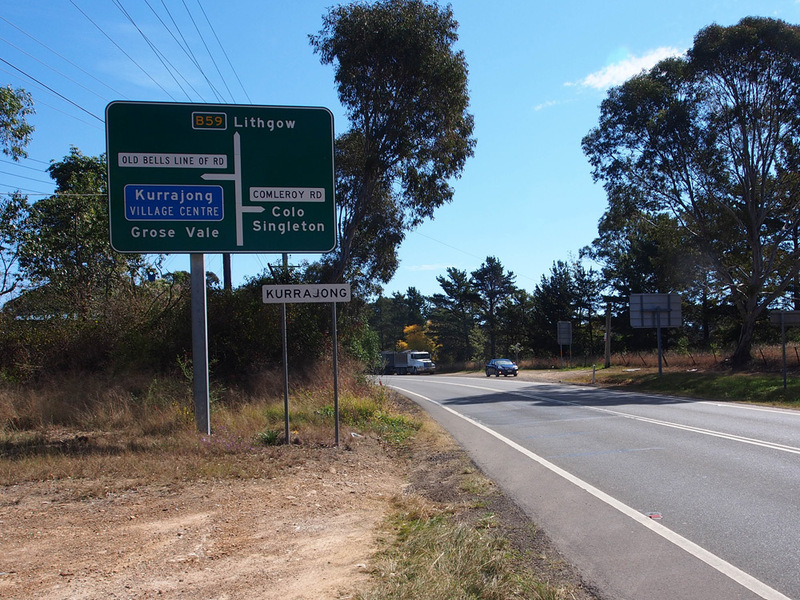 AD sign westbound on Bells Line of Road approaching the junction with Old Bells Line of Road & Mill Road, Kurrajong. 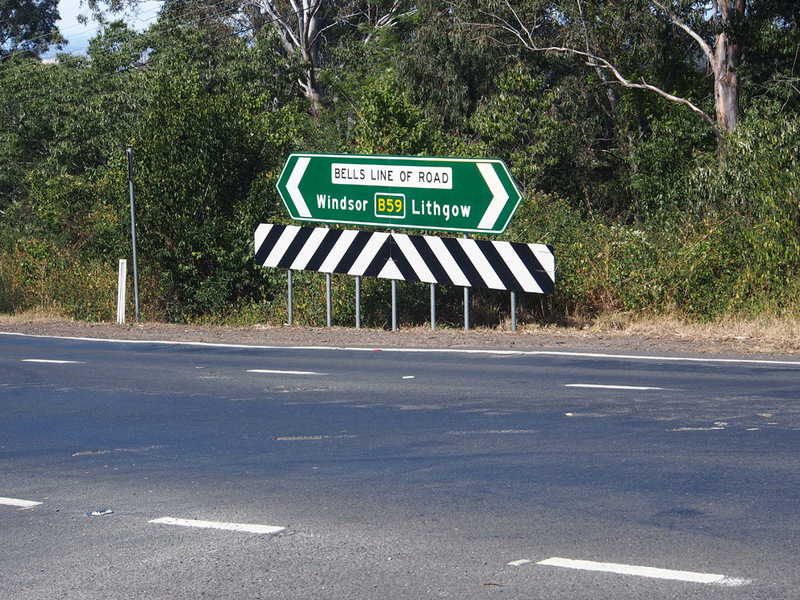 AD sign northbound on Old Bells Line of Road approaching the junction with Bells Line of Road, Kurrajong. 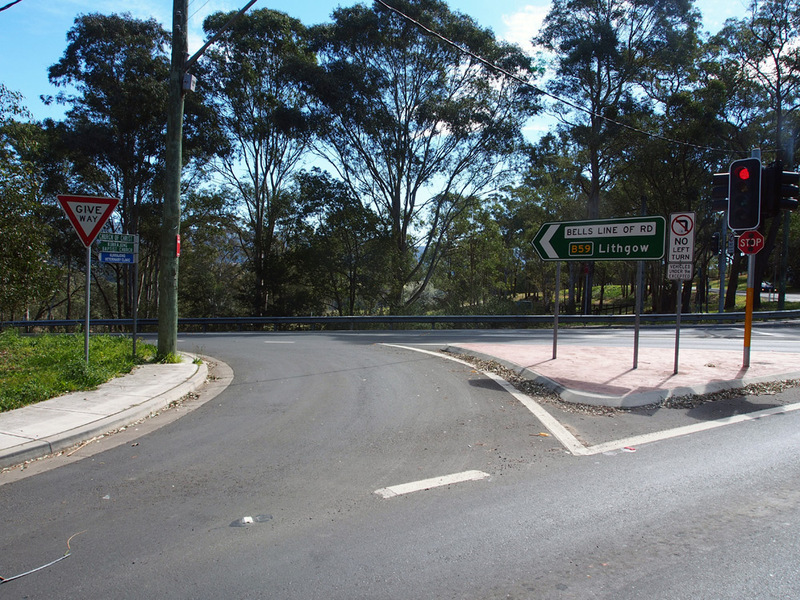 ID signs at the junction of Bells Line of Road, Old Bells Line of Road & Mill Road, Kurrajong. 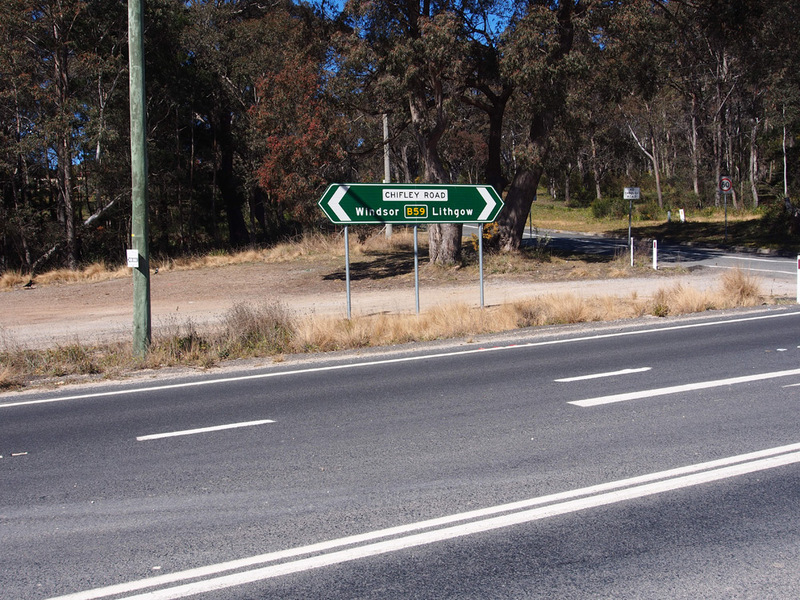 RD sign westbound on Bells Line of Road after the junction with Old Bells Line of Road, Kurrajong. 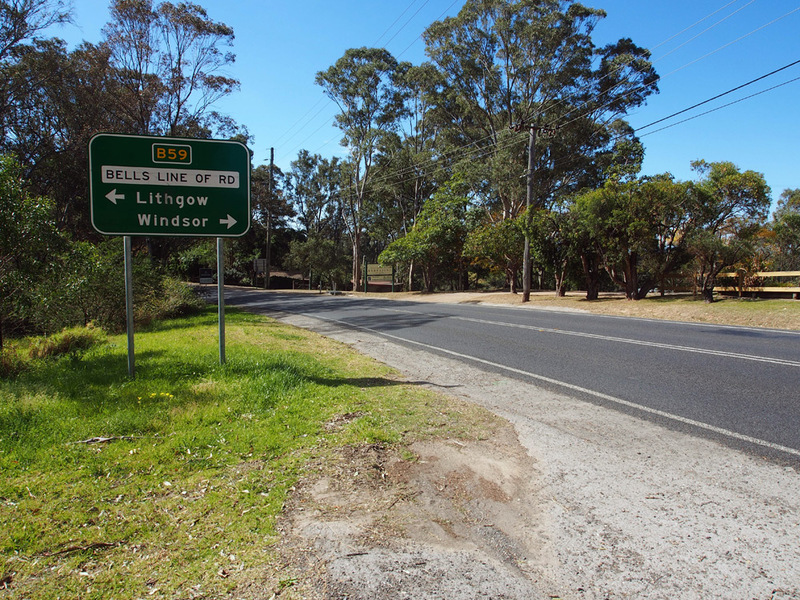 ID sign at the junction of Bells Line of Road & Old Bells Line of Road (west), 1km west of Kurrajong. 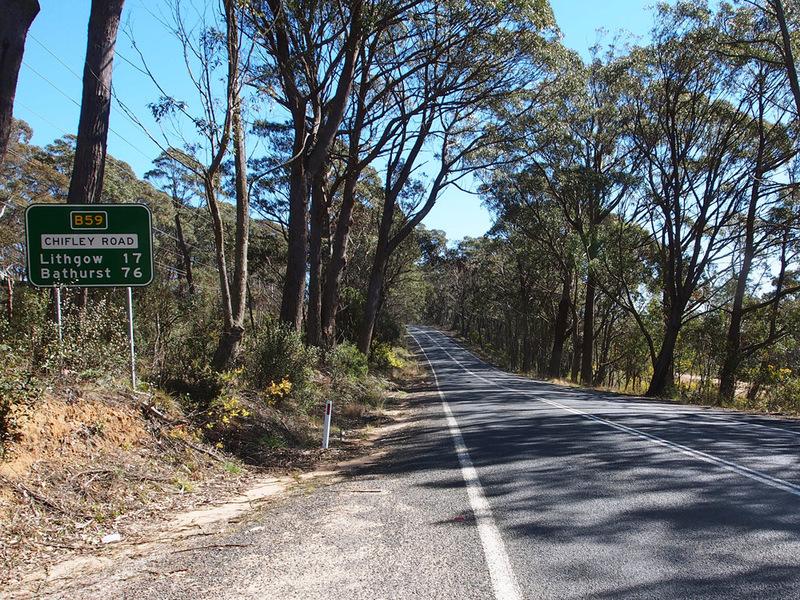 AD sign eastbound on Bells Line of Road approaching the junction with Old Bells Line of Road, 1km west of Kurrajong. 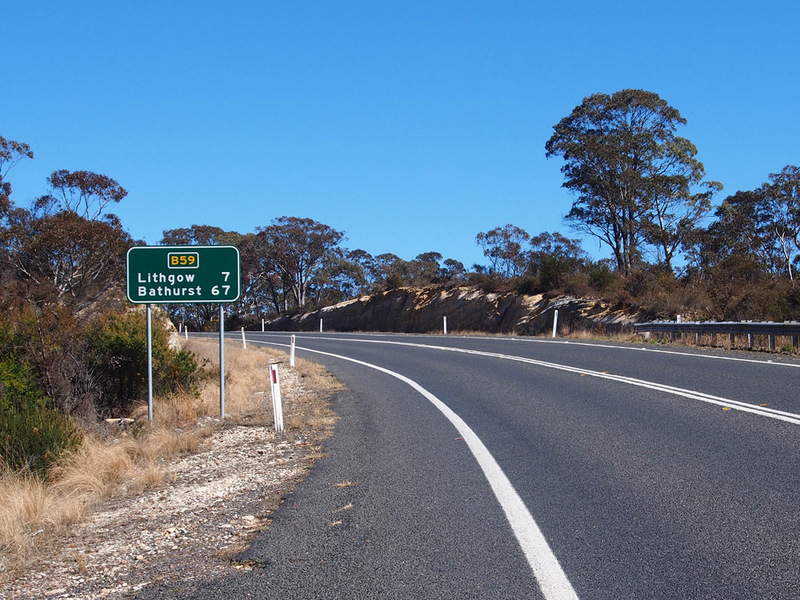 ID signs at the junction of Bells Line of Road & Mountain Lagoon Road, Bilpin. 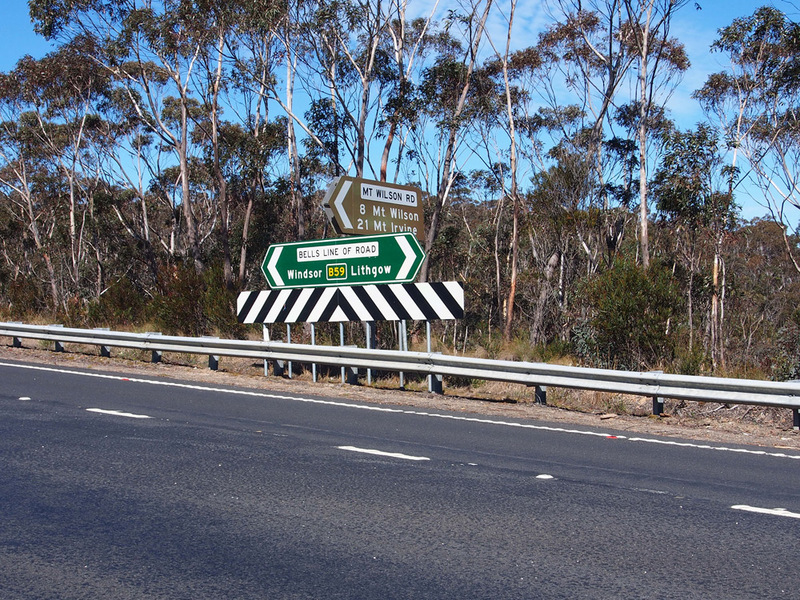 It's disappointing that a fingerboard sign is provided for Mountain Lagoon Road but not for the B59 - distances would be very handy at this point. 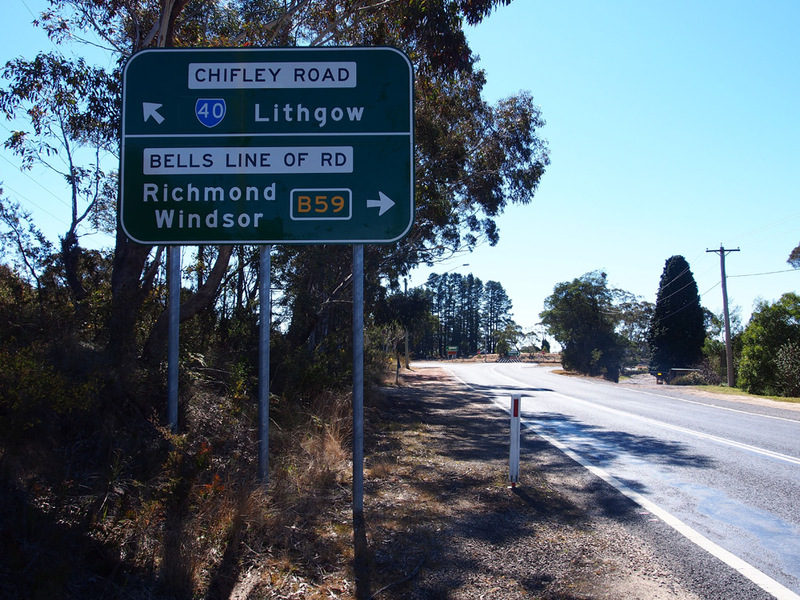 RD sign eastbound on Bells Line of Road near the Blue Mountains Botanic Gardens, 48km west of Windsor. ID sign at the junction of Bells Line of Road & Old Bells Line of Road (entrance to Blue Mountains Botanic Gardens), Mt Tomah. 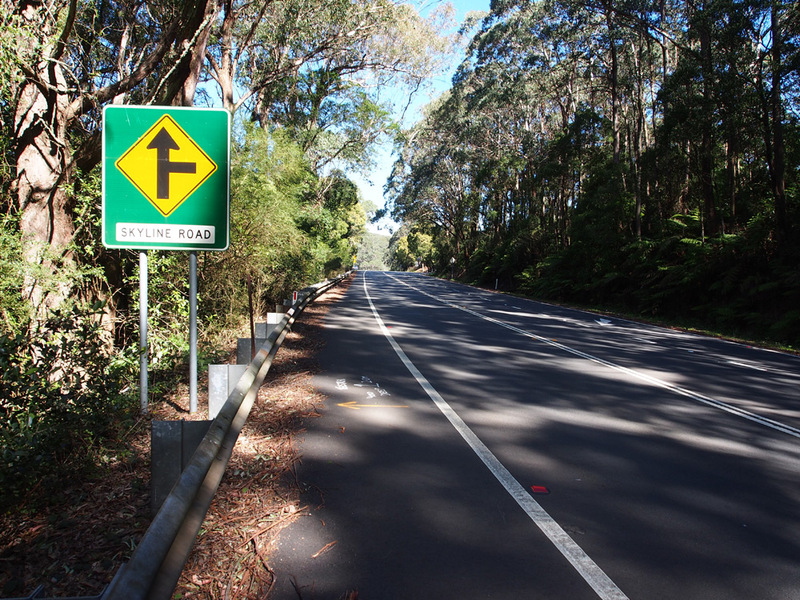 RD sign westbound on Bells Line of Road after Mt Tomah Botanic Gardens, approaching Skyline Road. 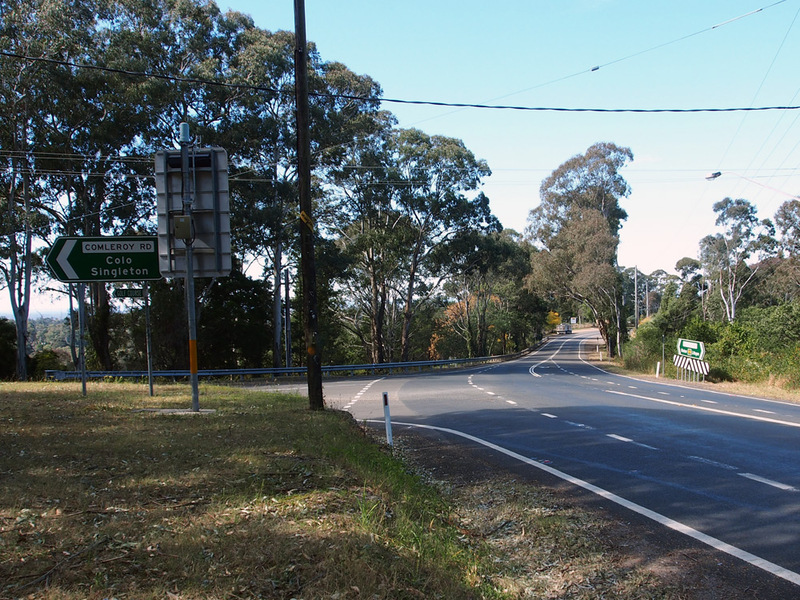 Combined warning and advance direction sign westbound on Bells Line of Road approaching the junction with Skyline Road, Mt Tomah. 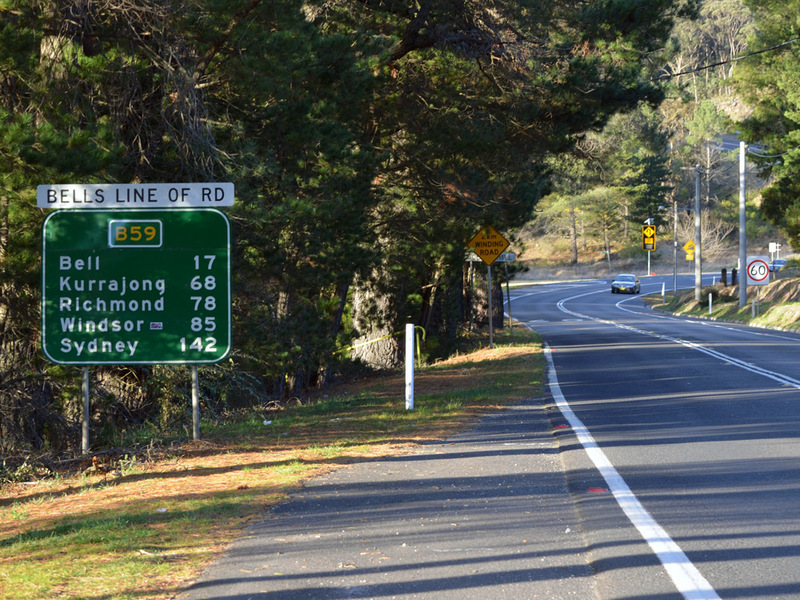 RD sign eastbound on Bells Line of Road after the junction with Mt Wilson Road, 7km east of Bell. 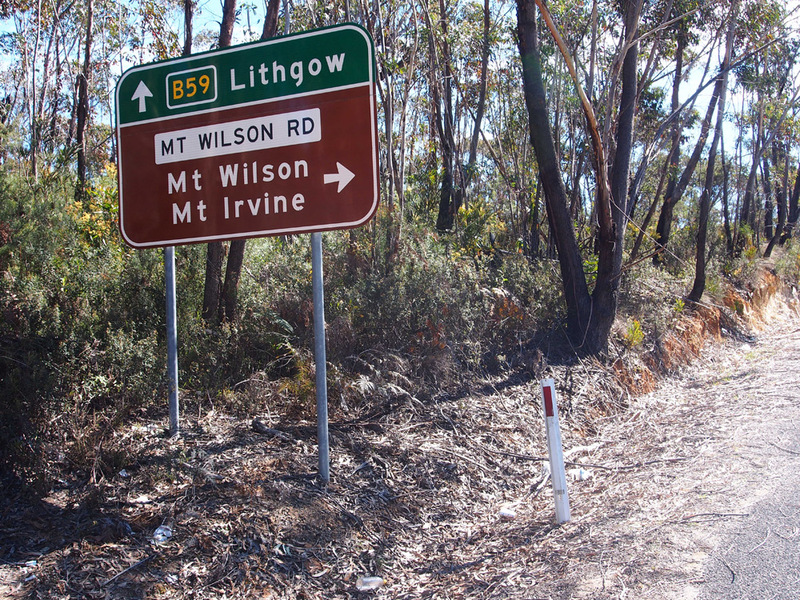 AD sign westbound on Bells Line of Road approaching the junction with Mt Wilson Road, 7km east of Bell. 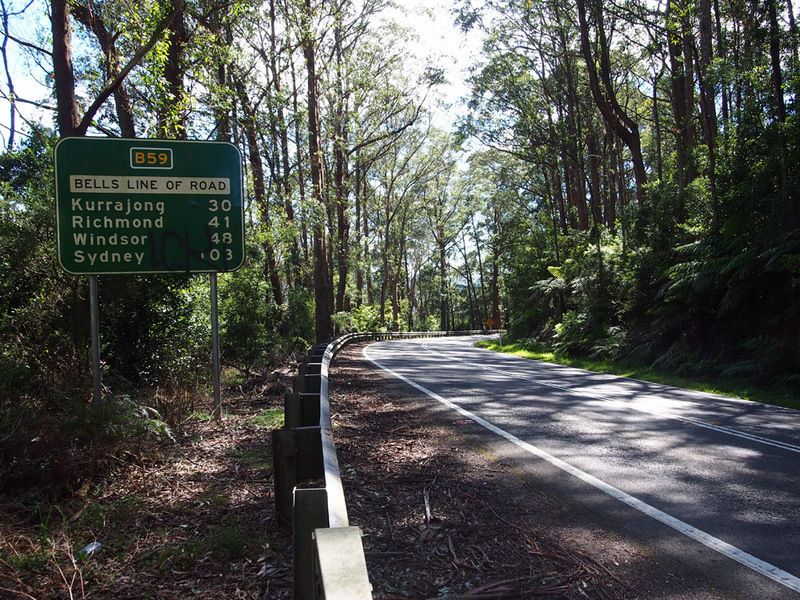 ID and fingerboard signs at the junction of Bells Line of Road & Mt Wilson Road, 7km east of Bell. 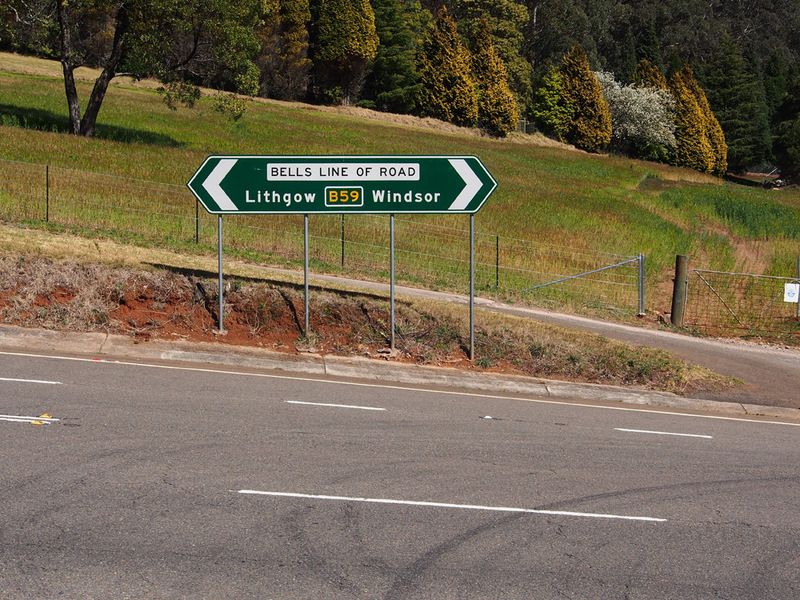 AD sign eastbound on Bells Line of Road approaching the junction with Mt Wilson Road, 7km east of Bell. 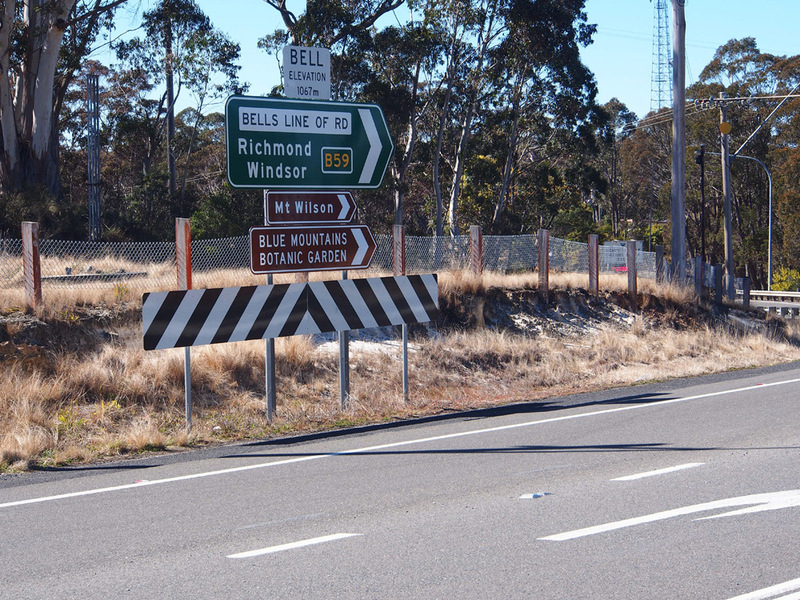 RD sign eastbound on Bells Line of Road after the Heavy Vehicle Checking Station at Bell. 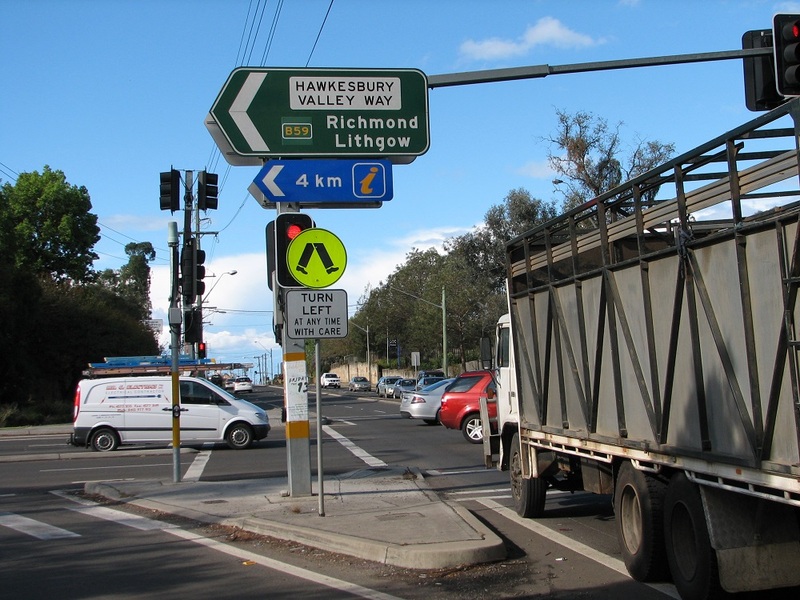 Looking west from the Heavy Vehicle Checking Station at Bell towards the junction with Darling Causeway & Chifley Road. 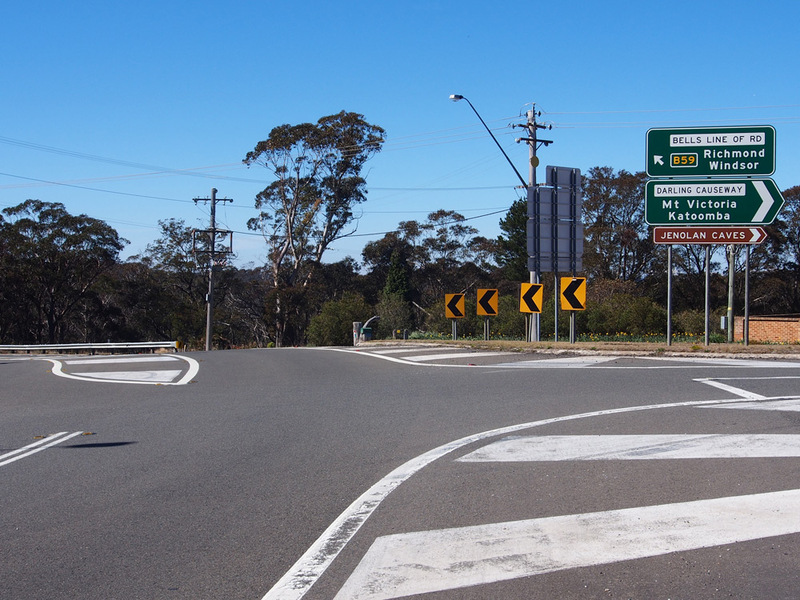 ID signs at the junction of Bells Line of Road, Chifley Road & Darling Causeway, Bell. Top photo: Michael Durrant, August 2013. Remaining 3 photos: Peter Renshaw, August 2013. 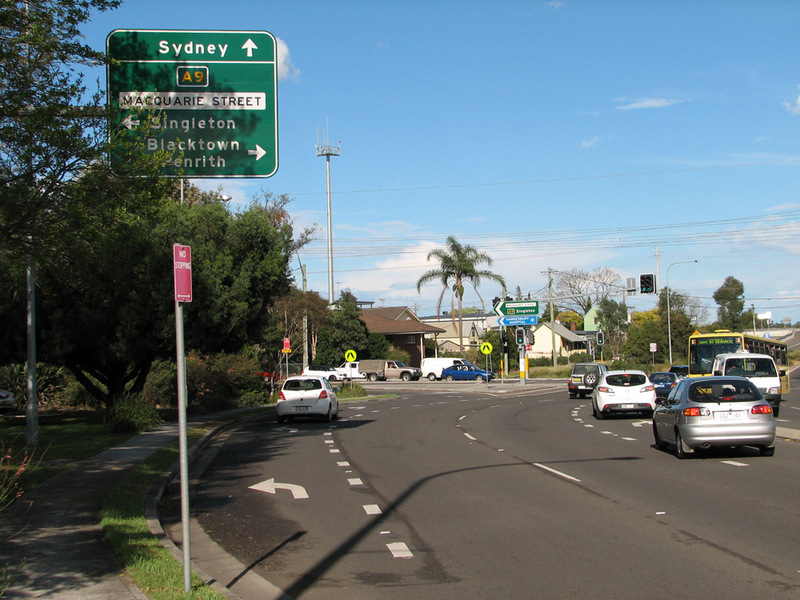 AD sign northbound on Darling Causeway approaching the junction with Bells Line of Road & Chifley Road, Bell. 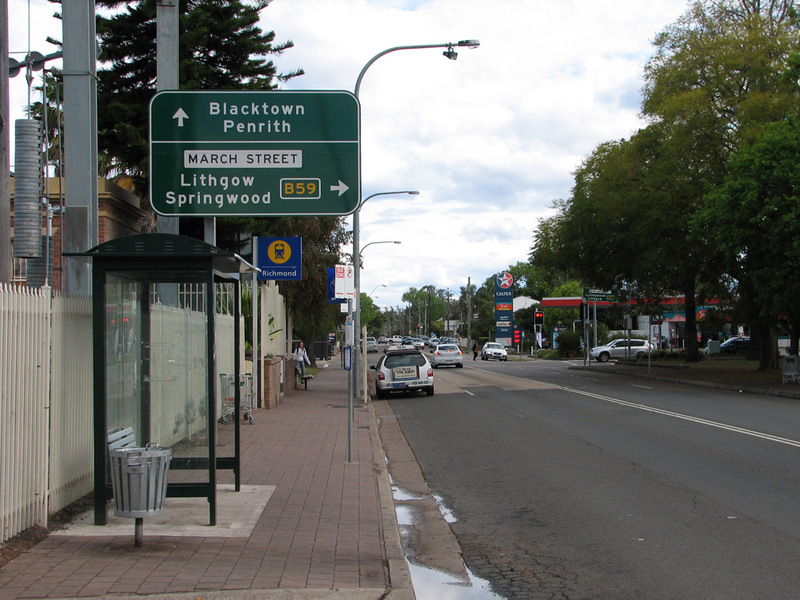 Note the remaining State Route 40 coverplate which was removed by the end of 2013. 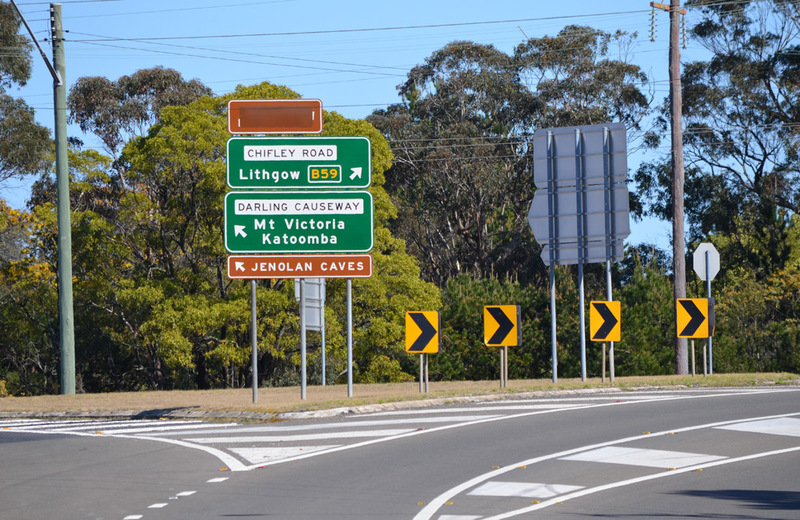 AD sign eastbound on Chifley Road approaching the junction with Bells Line of Road & Darling Causeway, Bell. 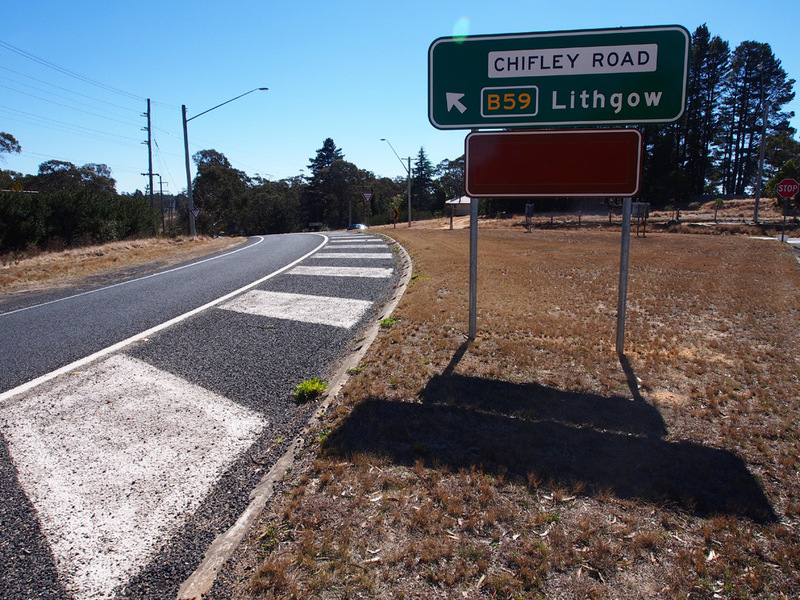 RD sign westbound on Chifley Road after the junction with Bells Line of Road & Darling Causeway, Bell. 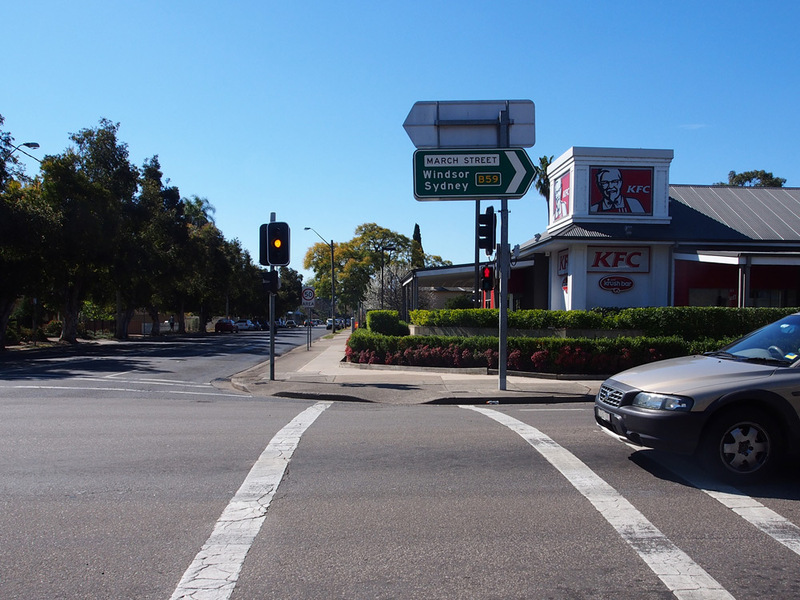 Coverplated AD sign westbound on Chifley Road approaching the junction with Old Bells Line of Road & Petra Road, Clarence. 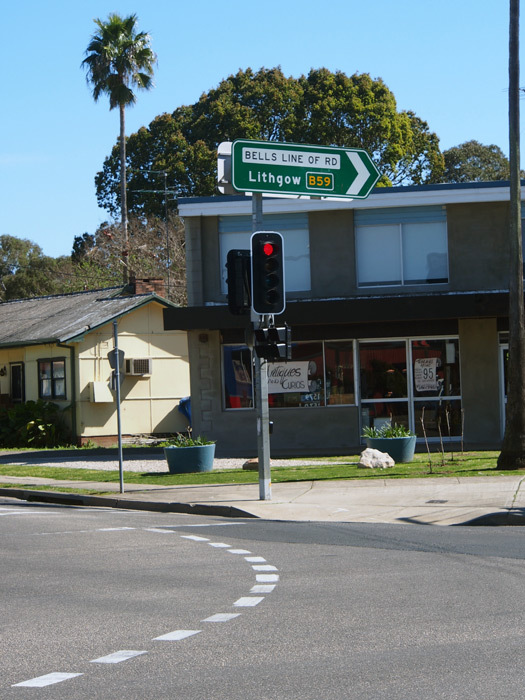 The blank coverplate covers the legend 'Zig Zag Railway' which is currently closed (as at February 2014). 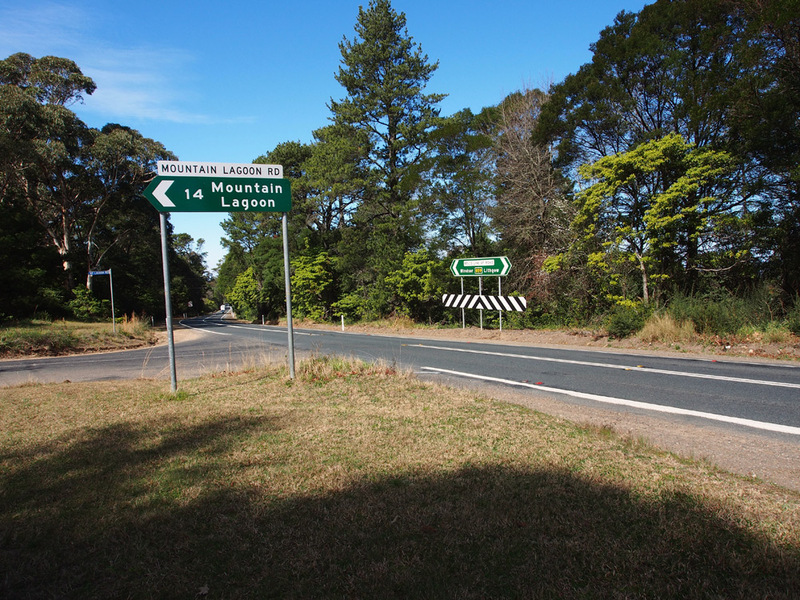 ID sign at the junction of Chifley Road, Old Bells Line of Road & Petra Road, Clarence. 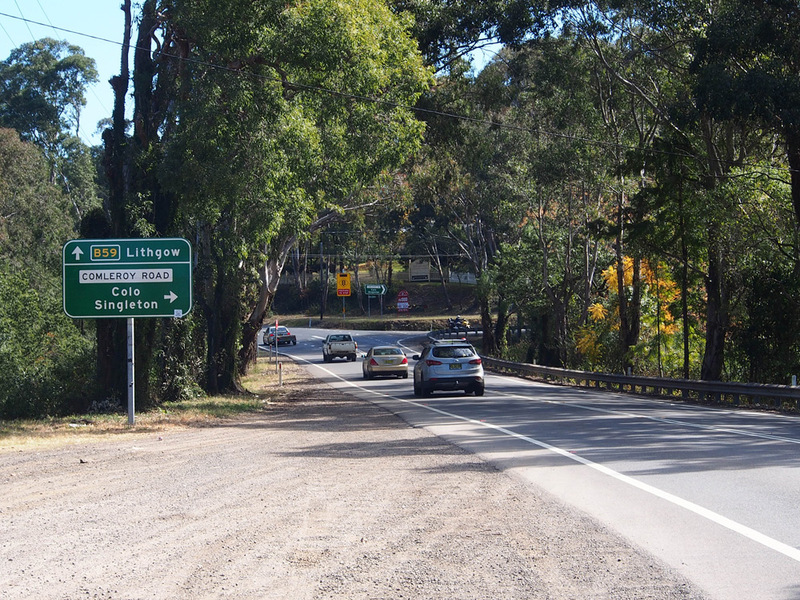 AD sign eastbound on Chifley Road approaching the junction with Old Bells Line of Road & Petra Road, Clarence. 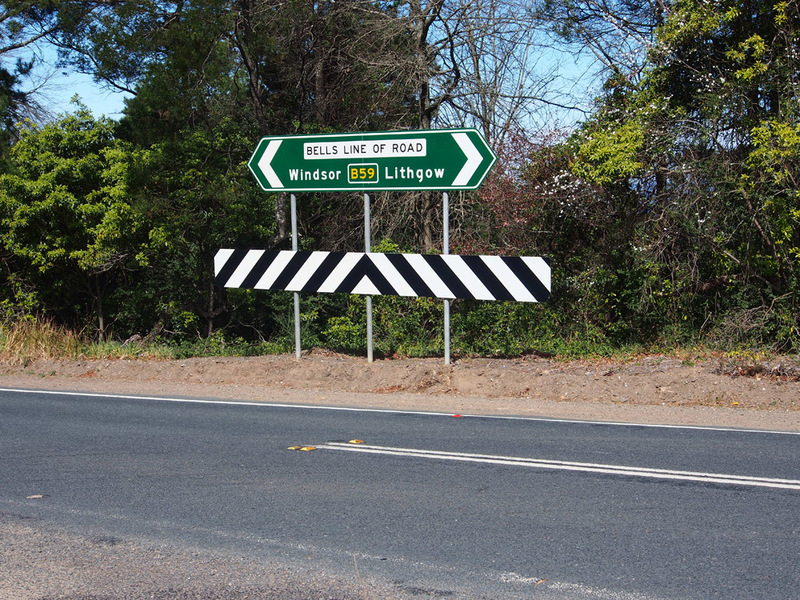 The blank coverplate covers the legend 'Zig Zag Railway' which is currently closed (as at February 2014). 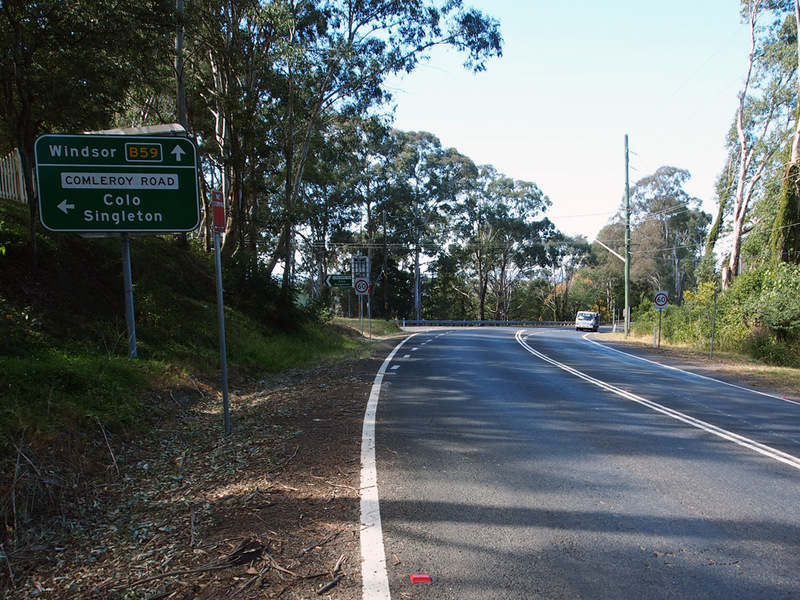 Coverplated RD sign eastbound on Bells Line of Road after the junction with the old access road to Zig Zag Railway at Mt Sinai. I am surprised that this sign, and its partner in the other direction, were updated and not removed. 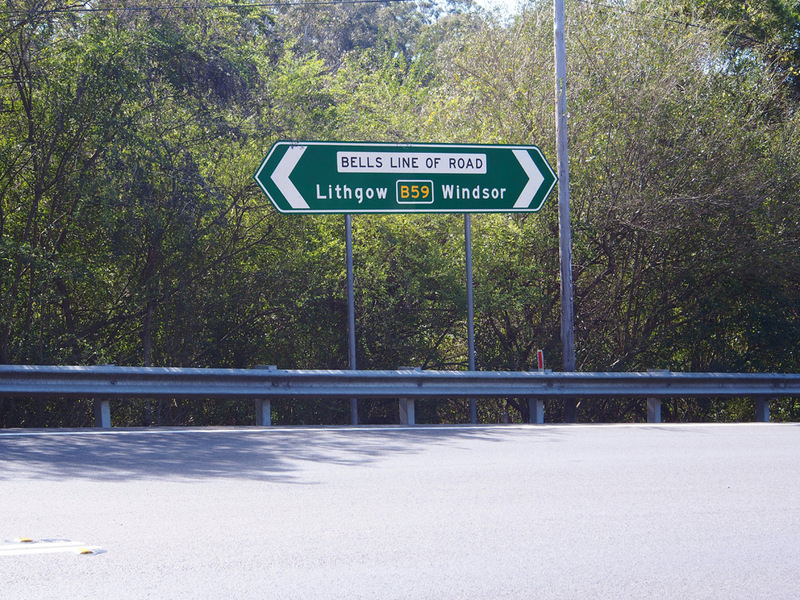 New RD sign eastbound on Bells Line of Road after the junction with the old access road to Zig Zag Railway at Mt Sinai. 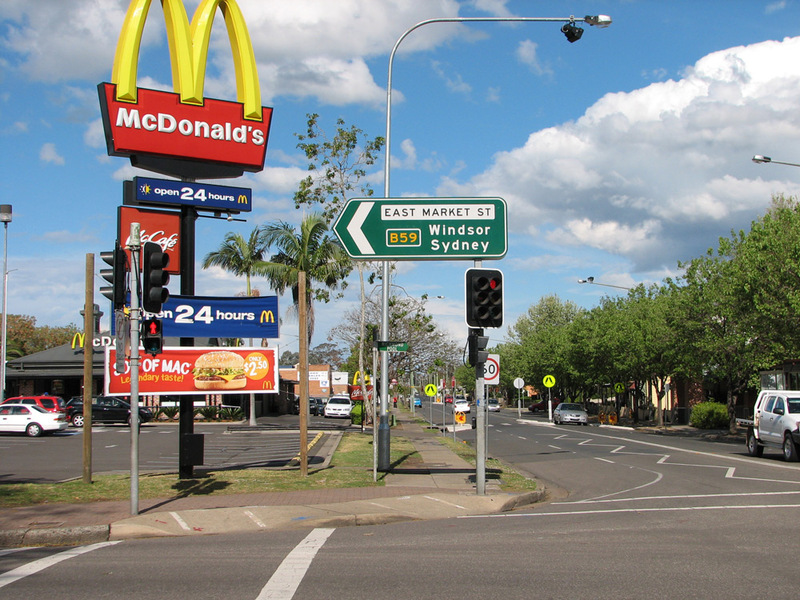 I am surprised that this sign, and its partner in the other direction, were updated and not removed. 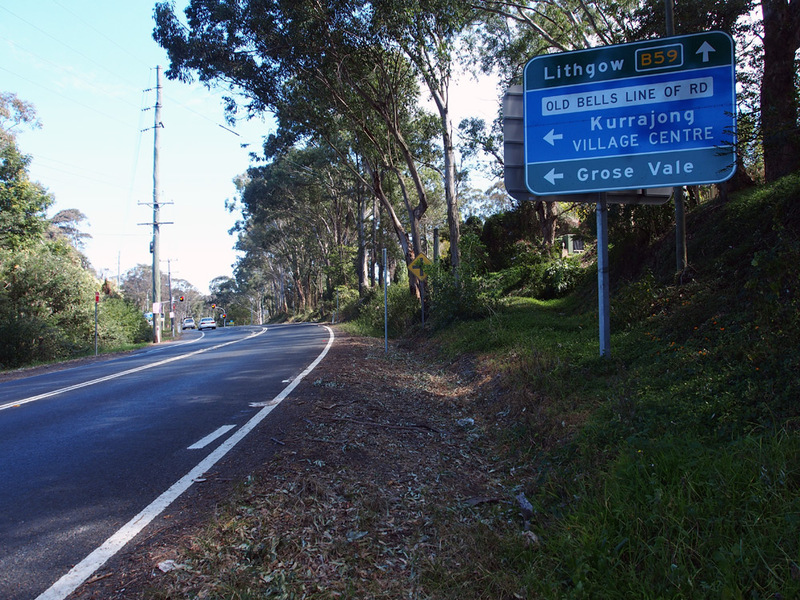 RD sign eastbound on Chifley Road approaching the start of the climb up Scenic Hill, Corney Town (Lithgow). 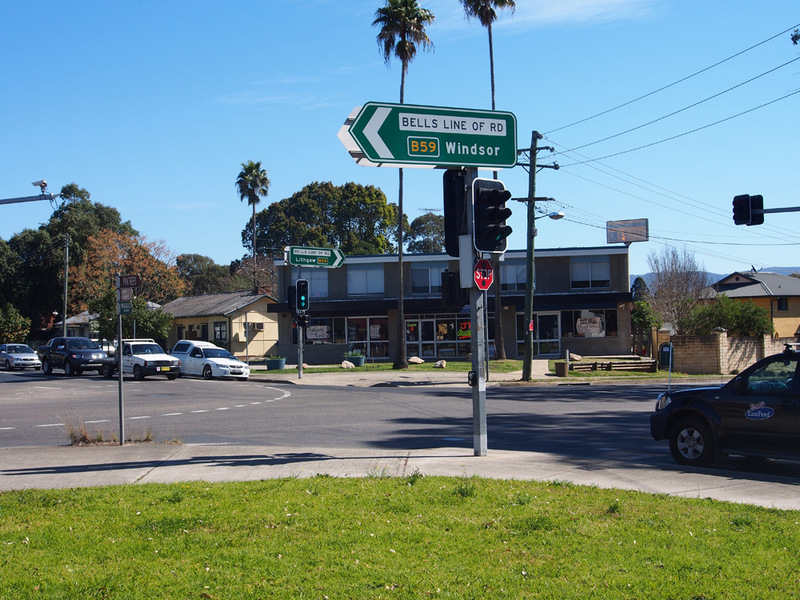 Note the 'Bells Line of Road' name plate - this section of road is often referred to as part of Bells Line of Road, however that road actually terminates at Bell. 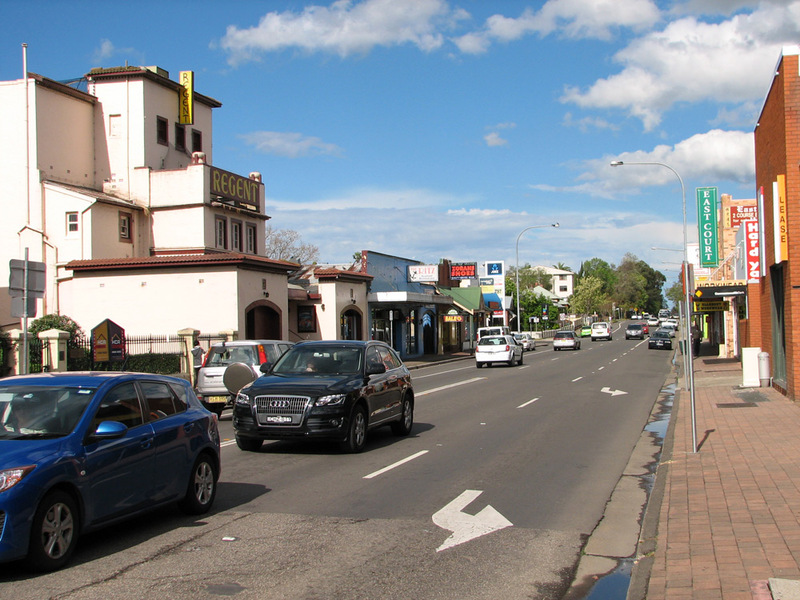 Mort Street looking west towards the junction with Lithgow Street, Lithgow. 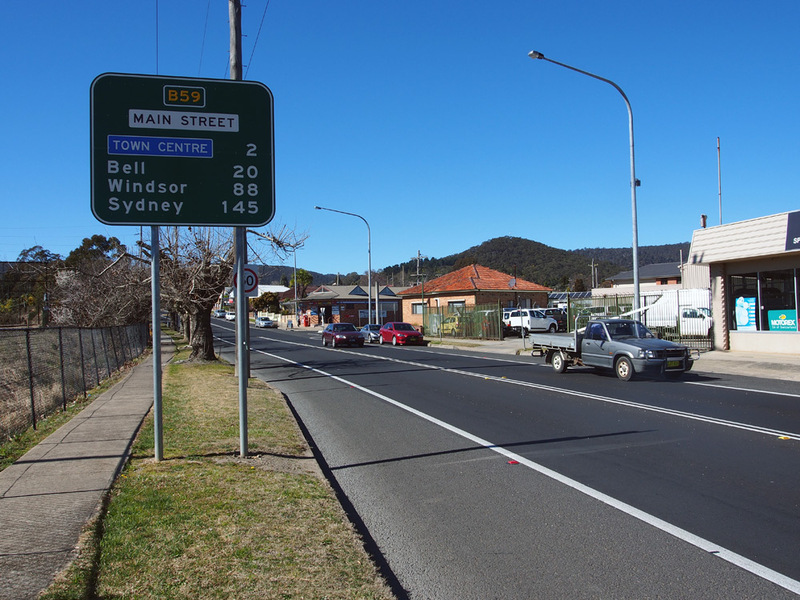 B59 does a quick dog-leg from Mort Street to Main Street via Lithgow Street at the western end of Lithgow CBD. 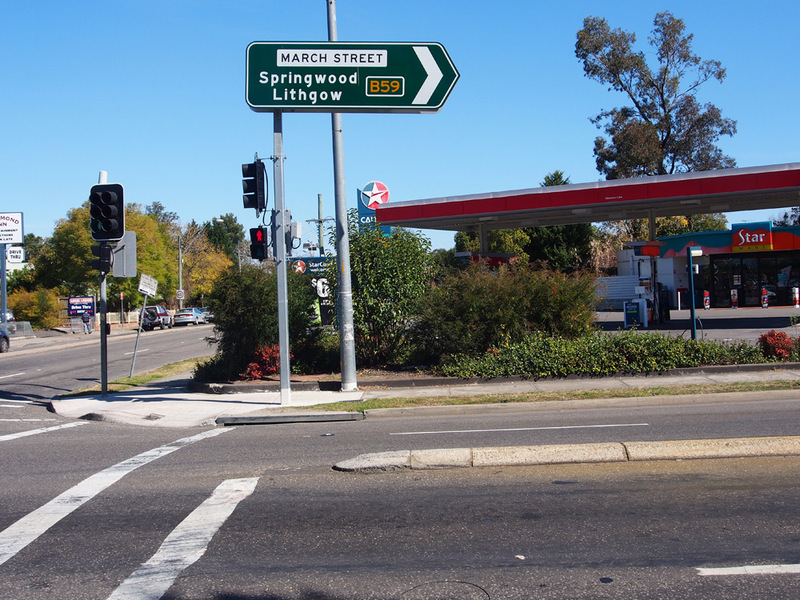 ID signs at the junction of Lithgow & Mort Streets, Lithgow. 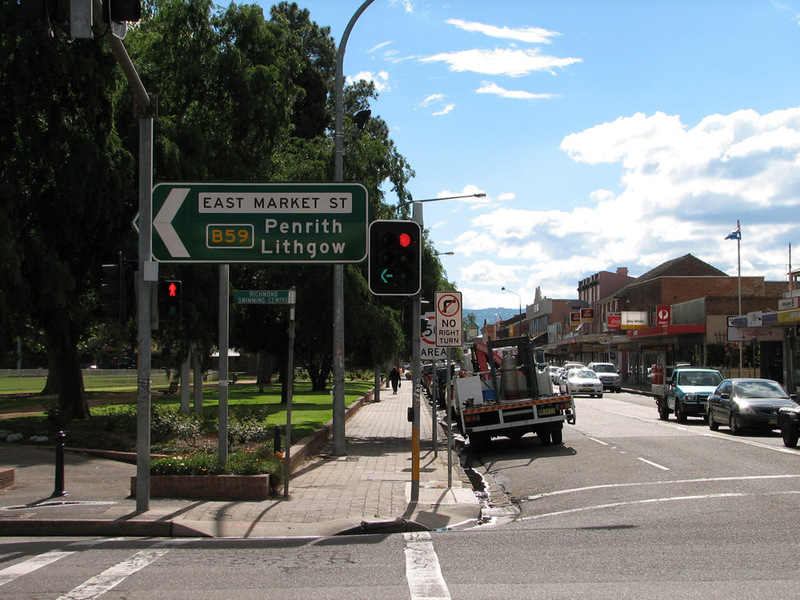 ID signs at the junction of Lithgow & Main Streets, Lithgow. 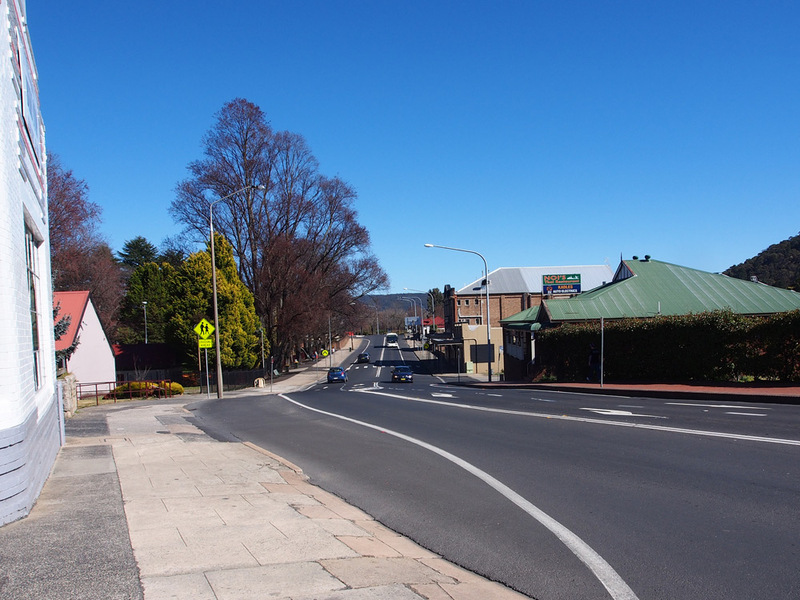 Main Street looking west from the junction with Lithgow Street, Lithgow. 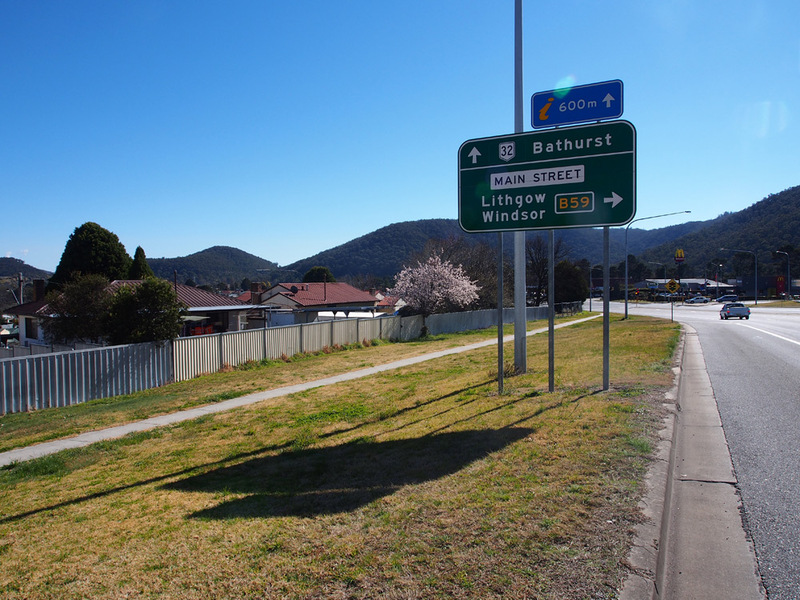 AD sign eastbound on Main Street approaching the junction with Lithgow Street, Lithgow. 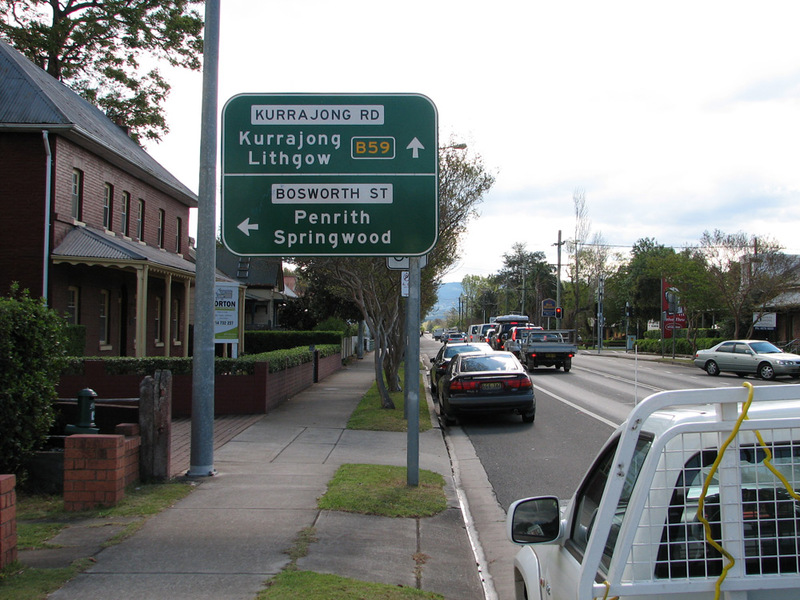 RD sign eastbound on Main Street near the junction with Great Western Highway, Lithgow. 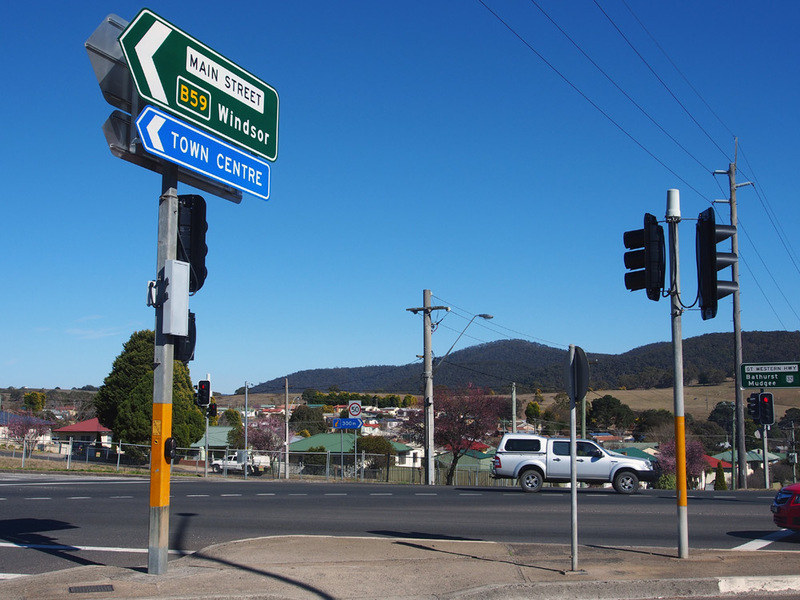 ID signs at the junction of Great Western Highway & Main Street, Lithgow. 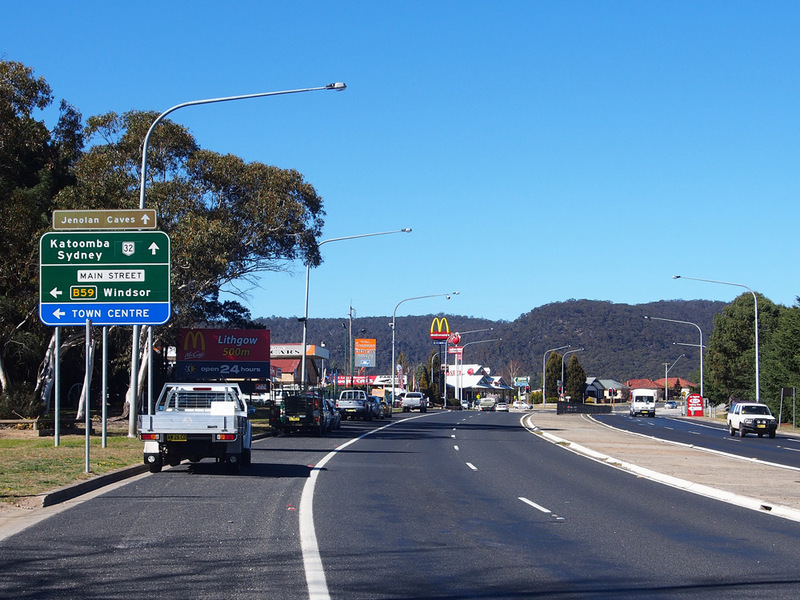 AD sign southbound on Great Western Highway approaching the junction with Main Street, Lithgow. 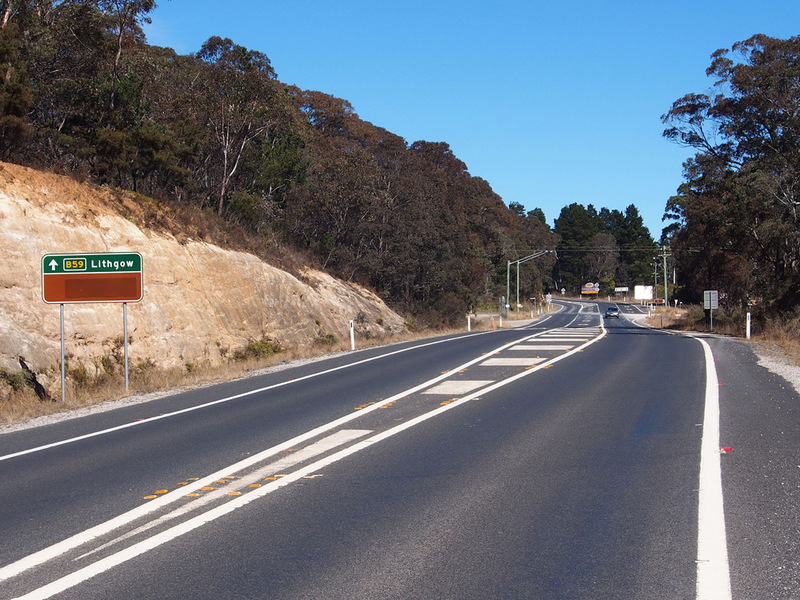 As at the end of 2013, the A32 route marker had yet to be uncovered.